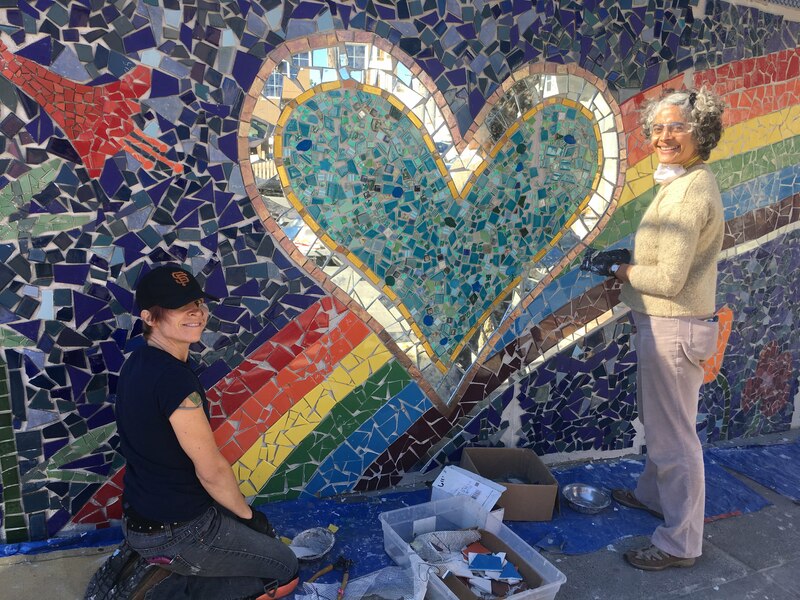 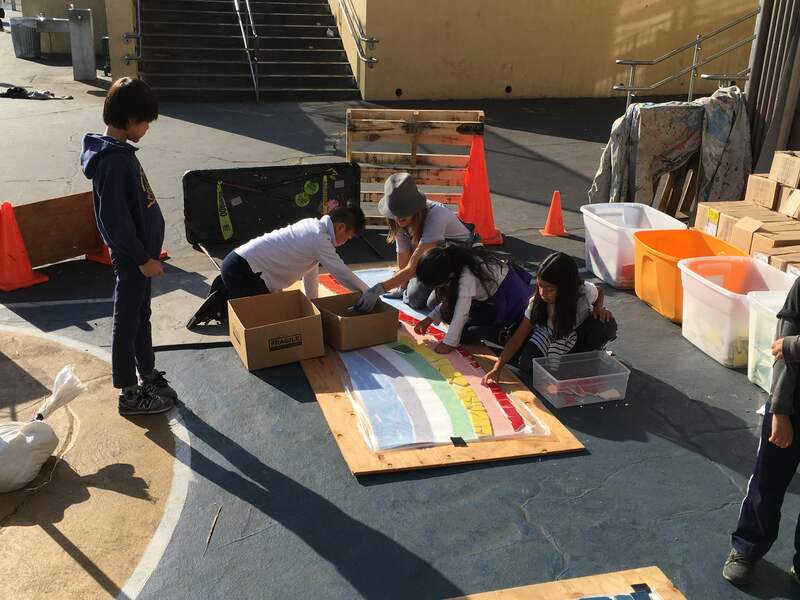 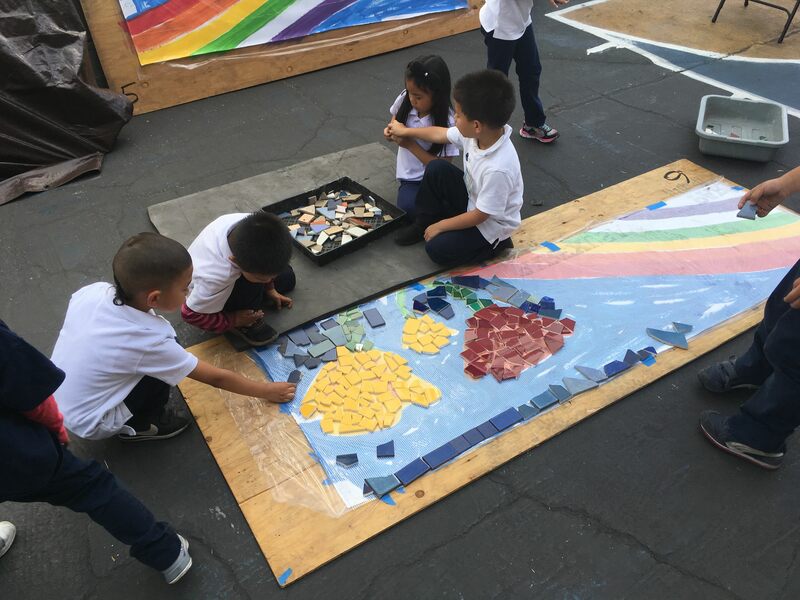 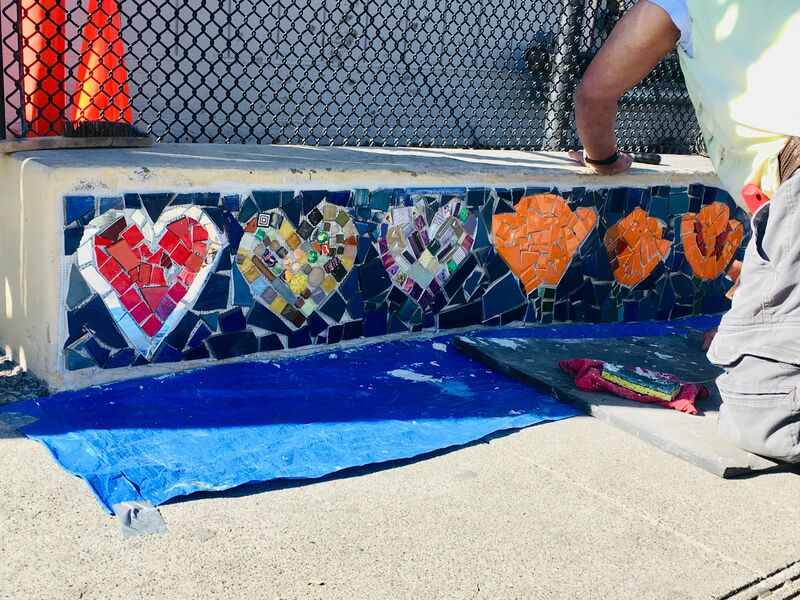 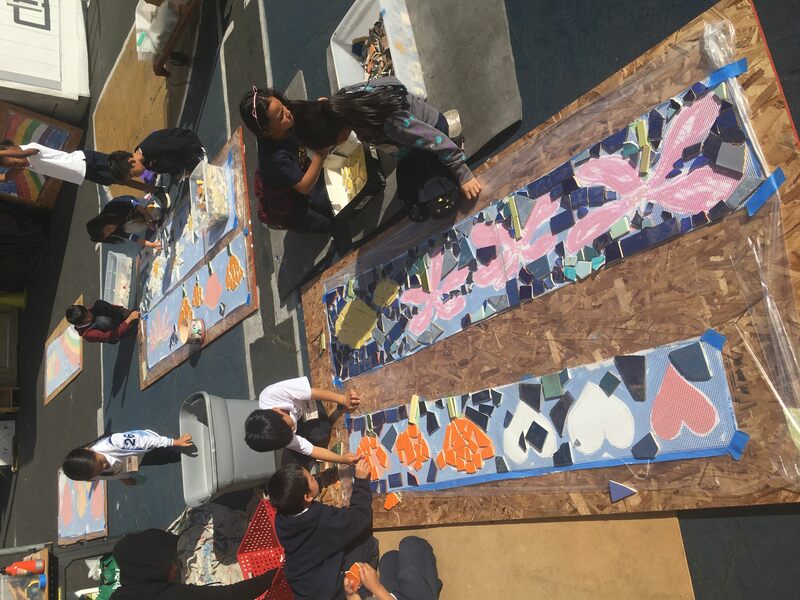 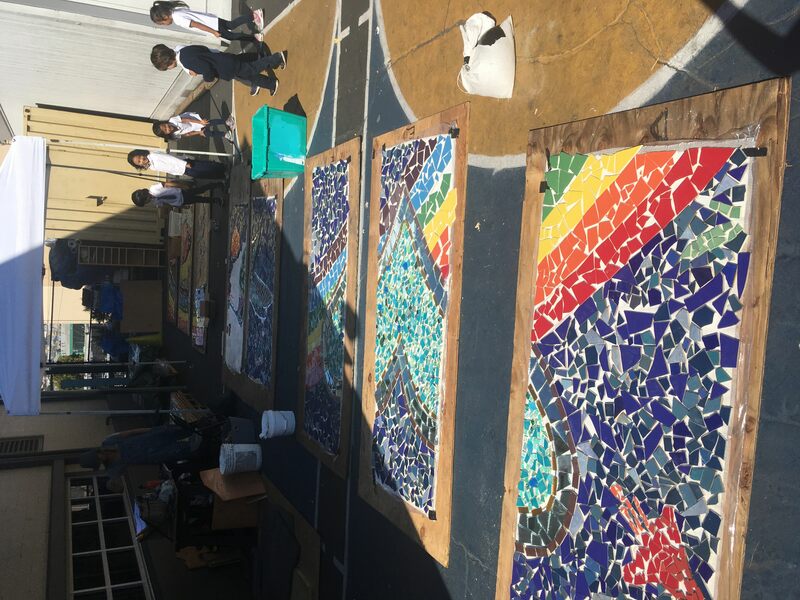 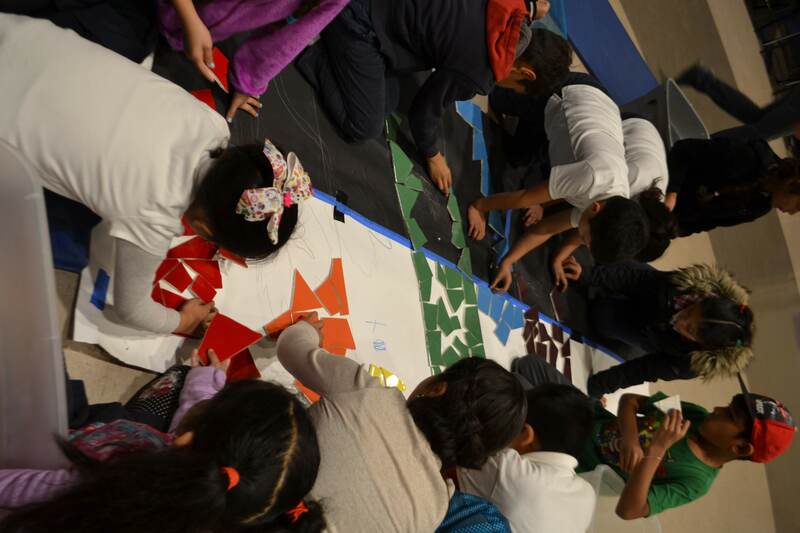 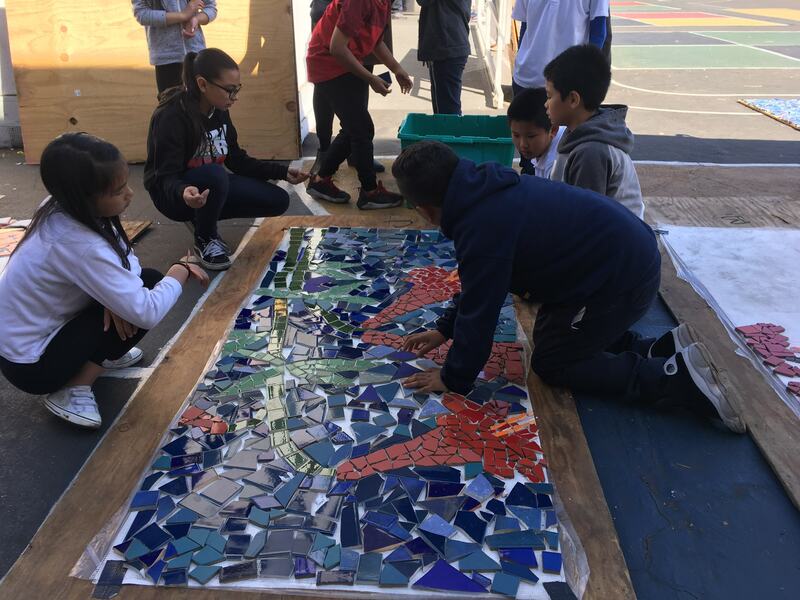 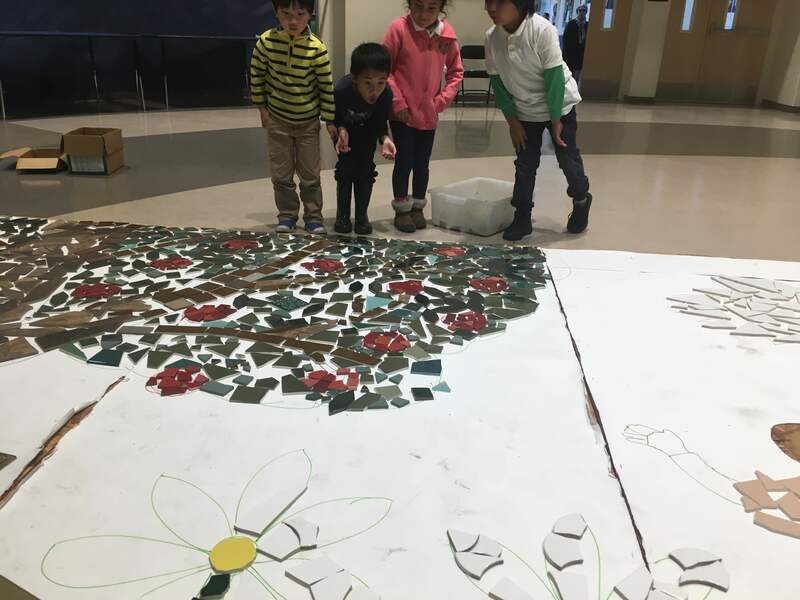 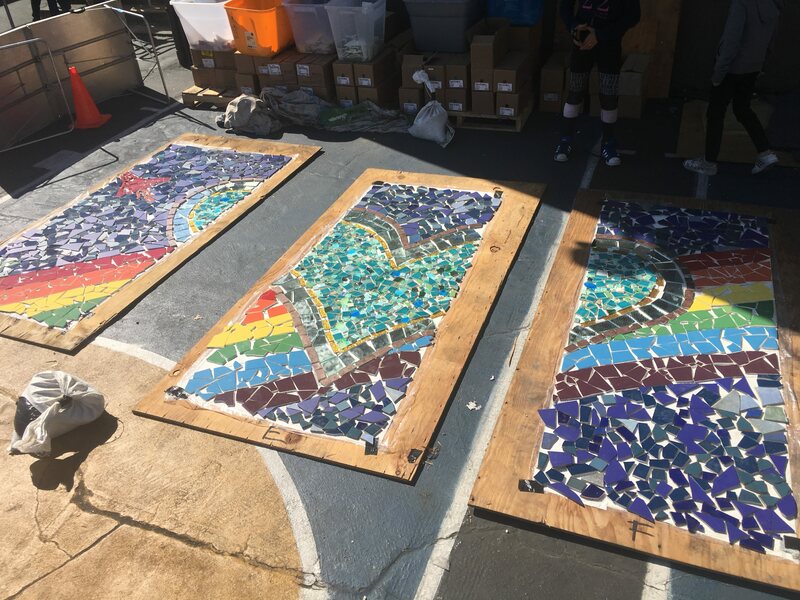 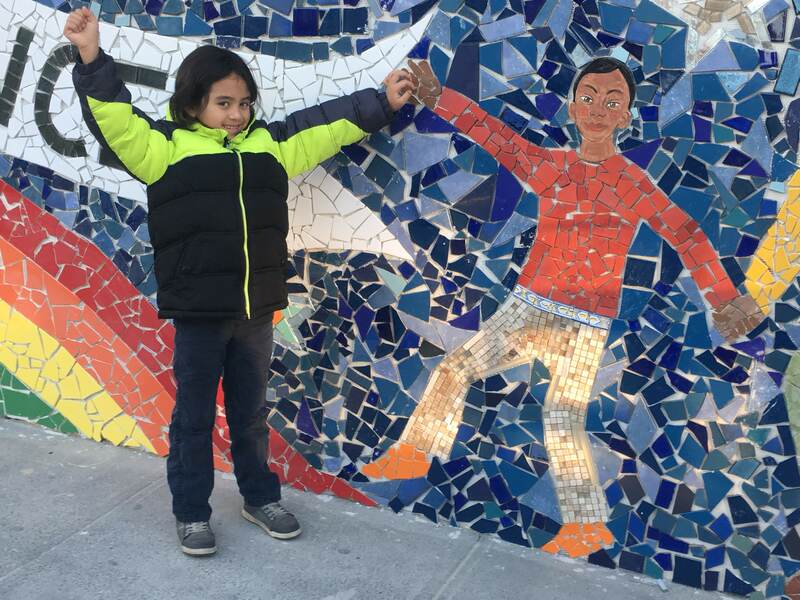 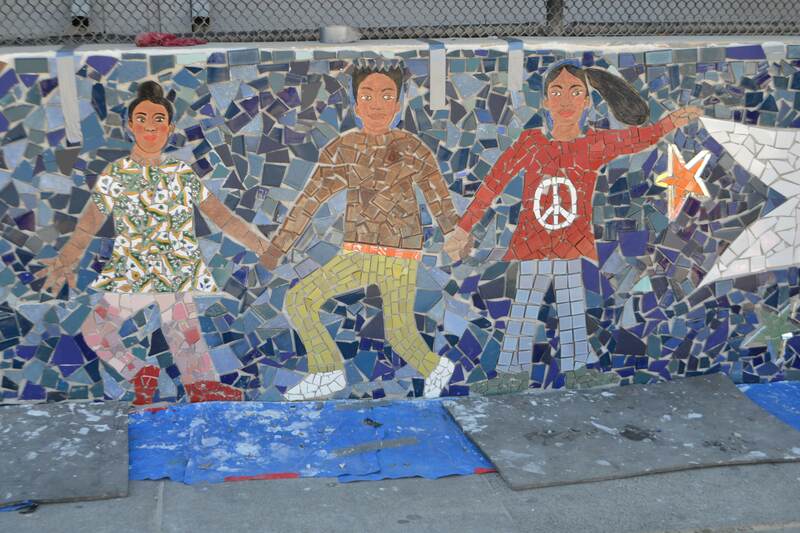 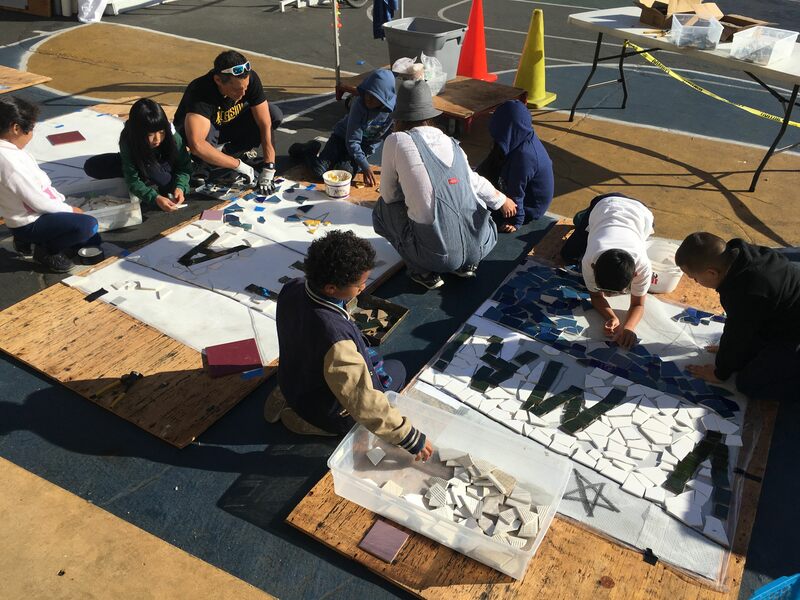 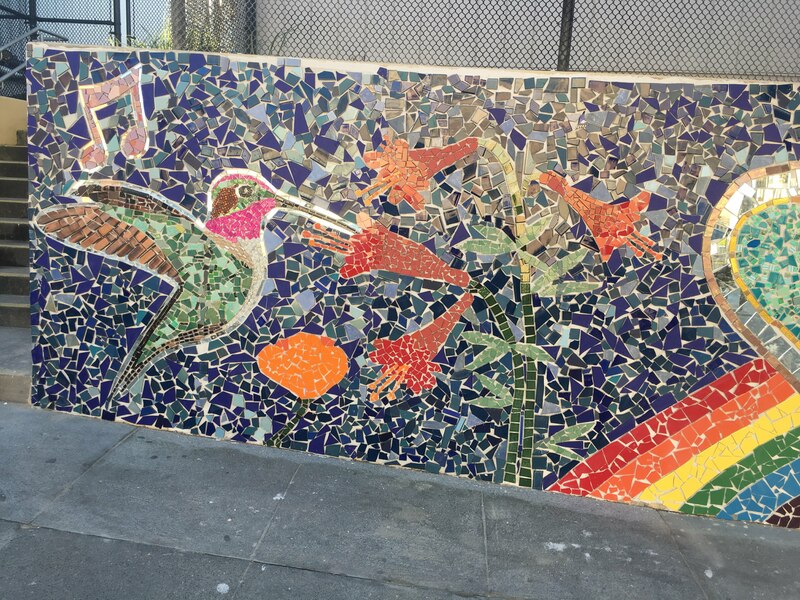 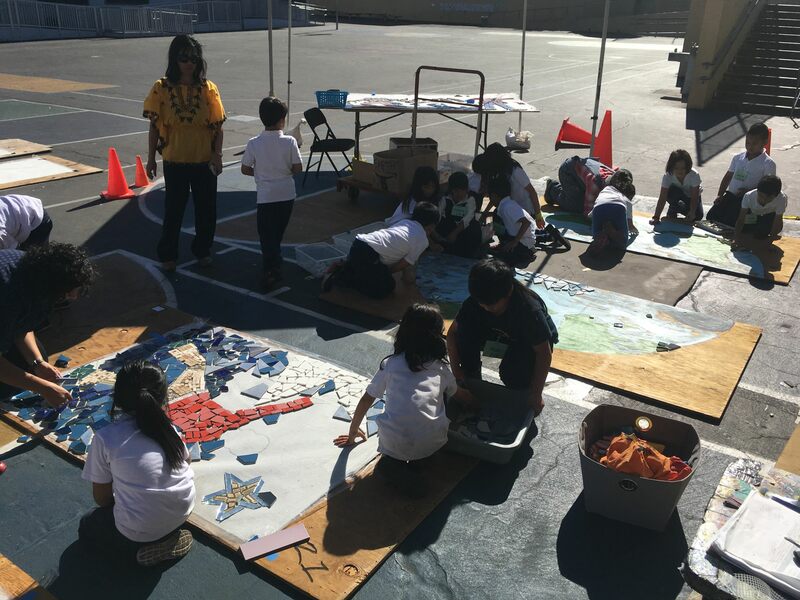 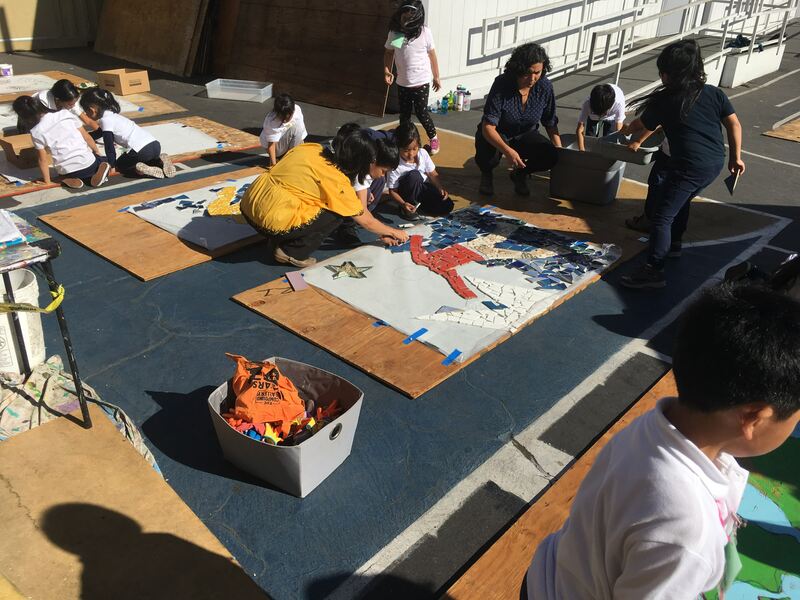 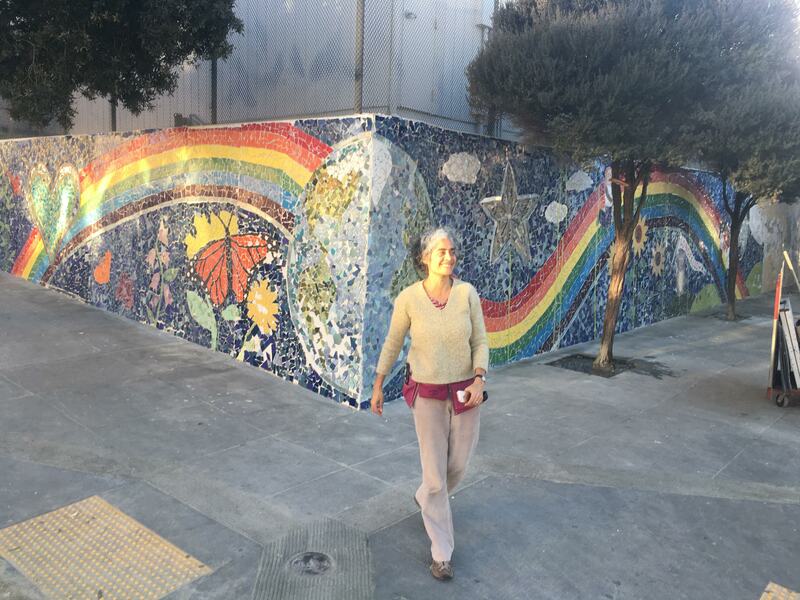 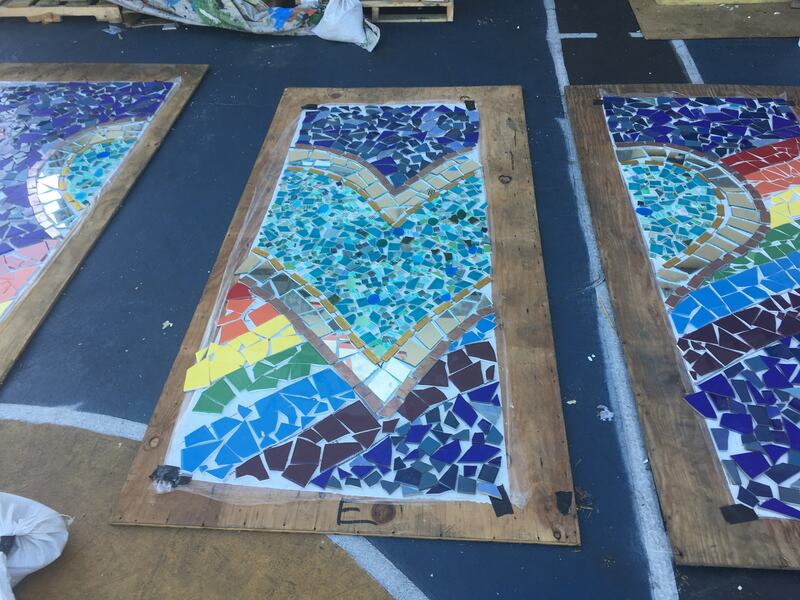 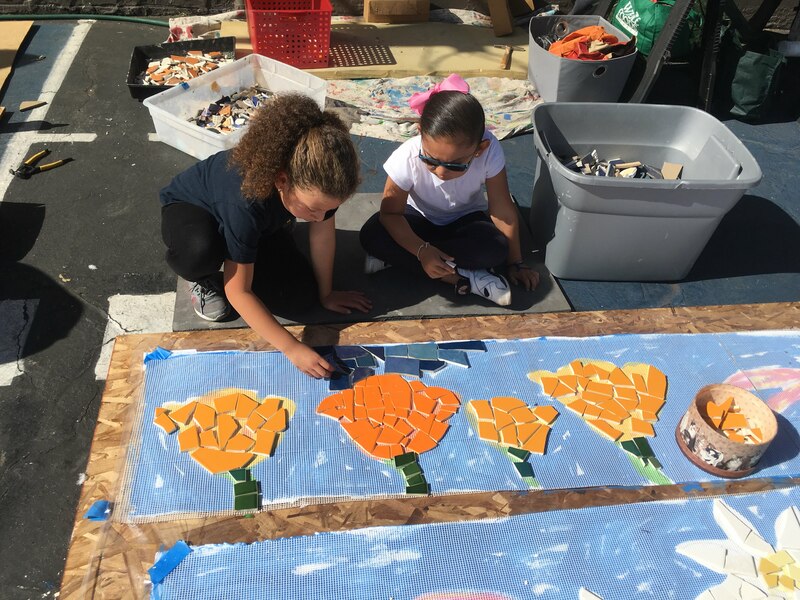 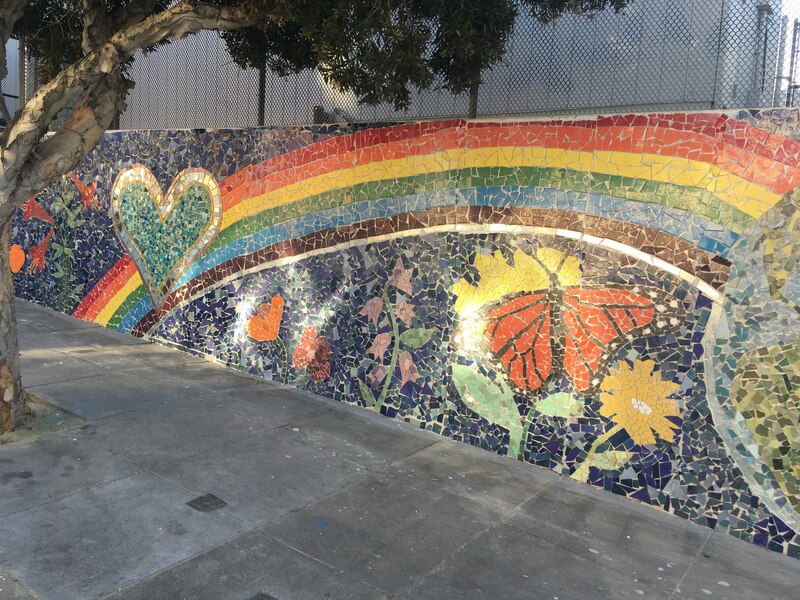 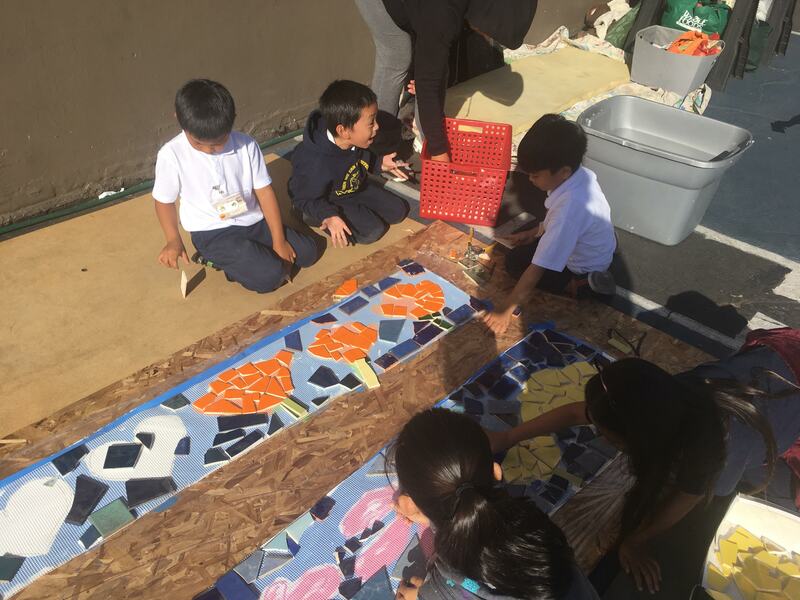 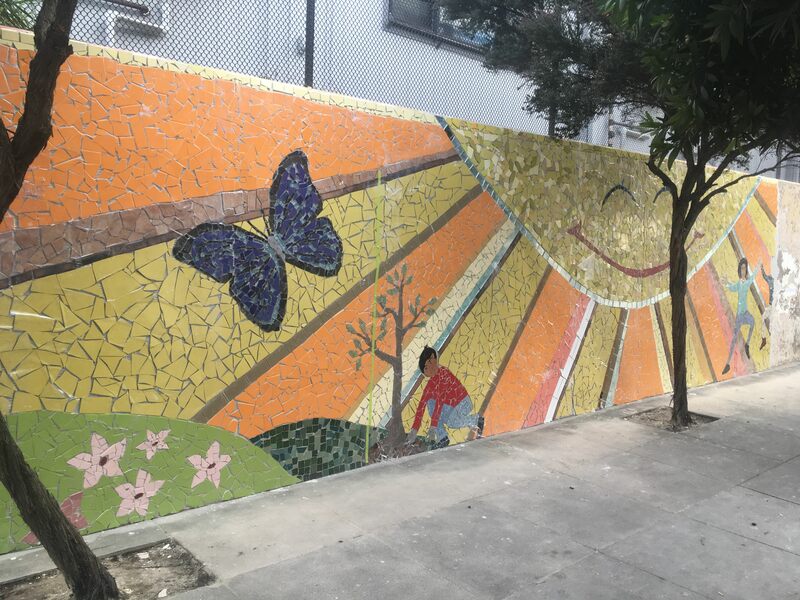 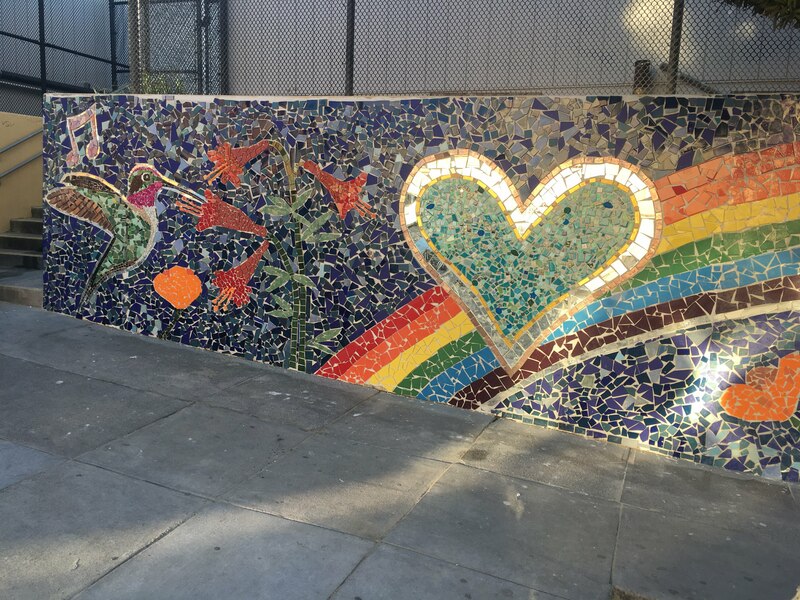 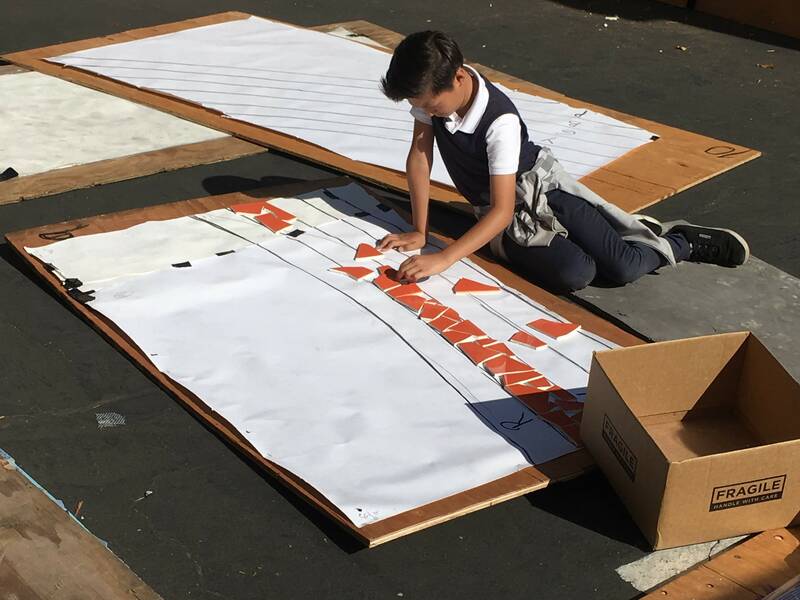 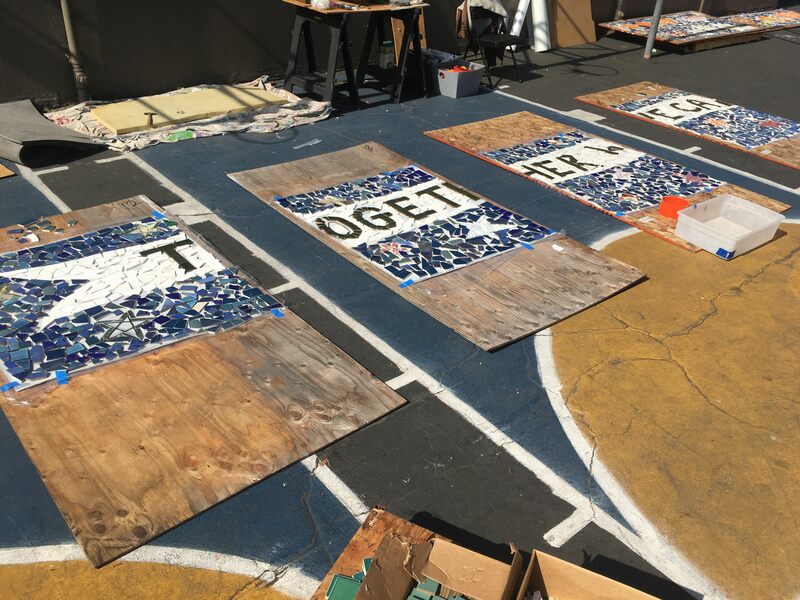 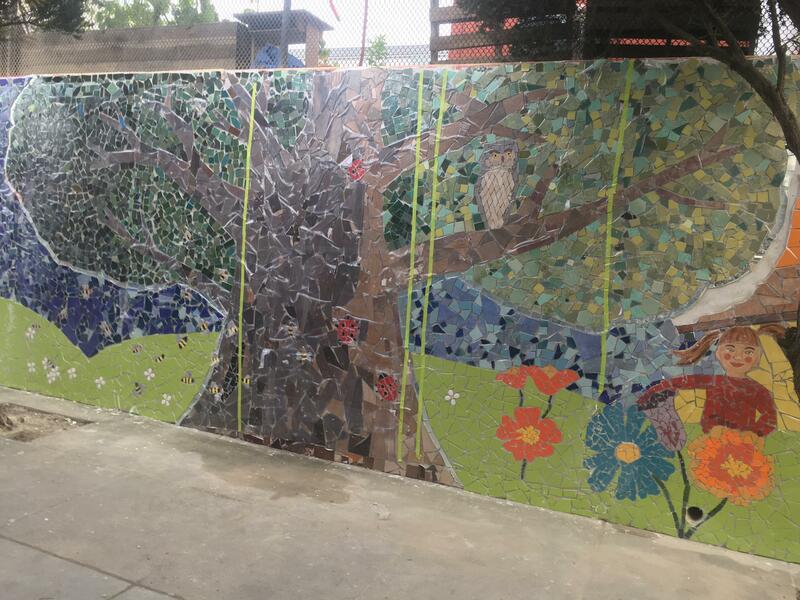 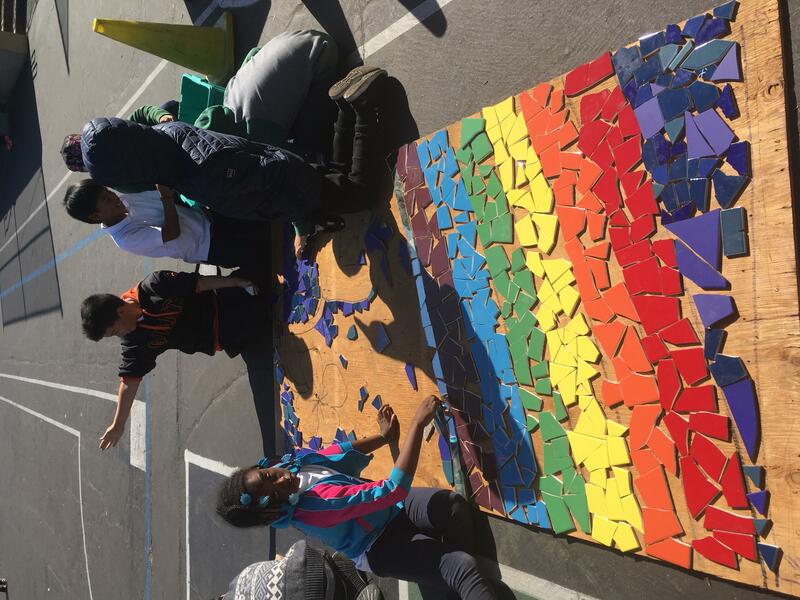 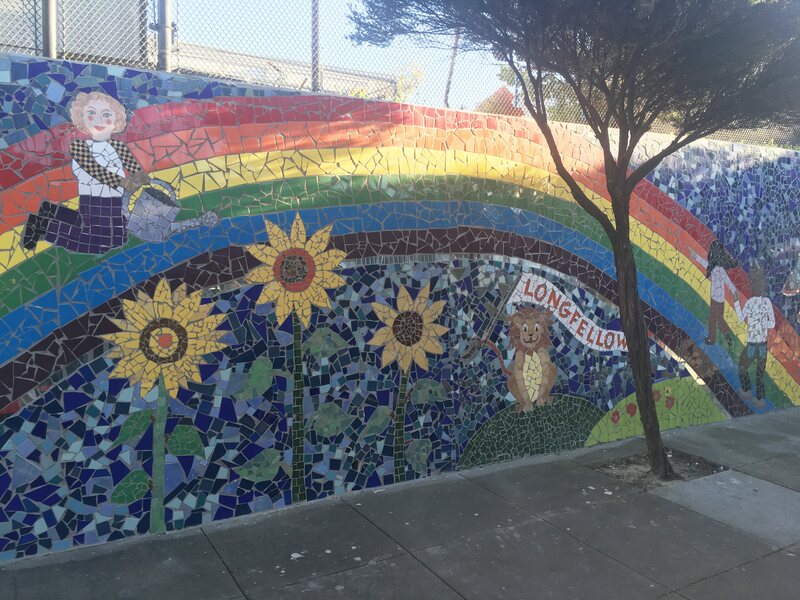 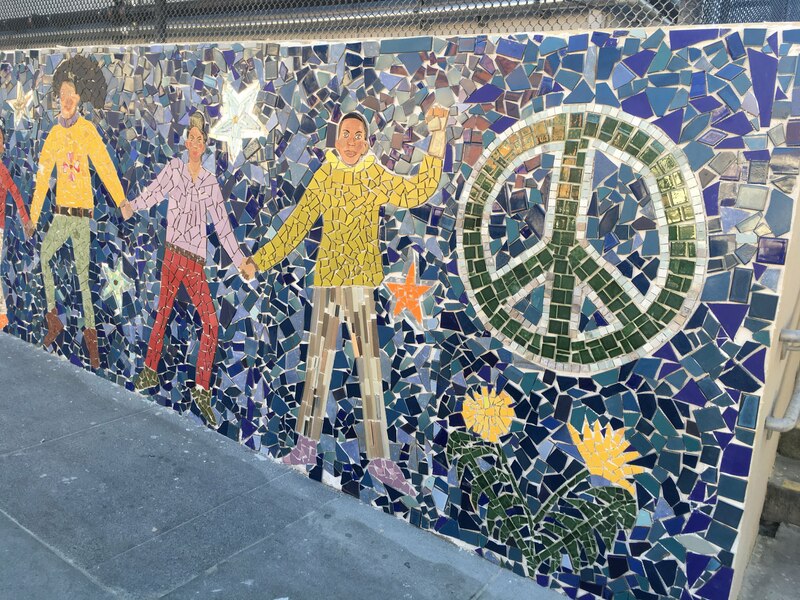 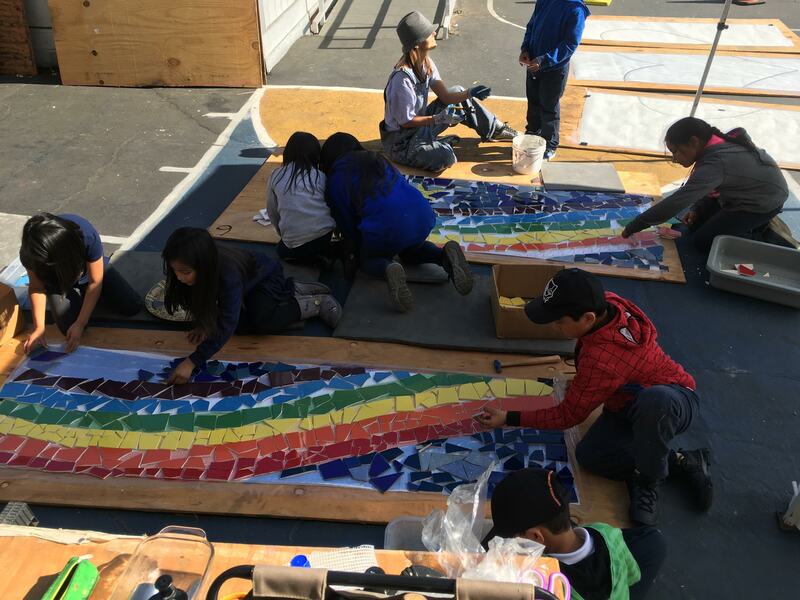 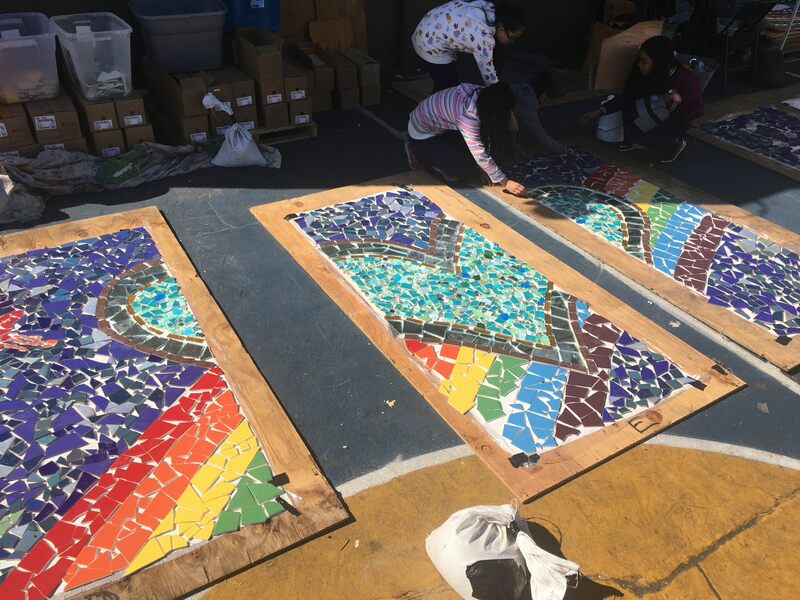 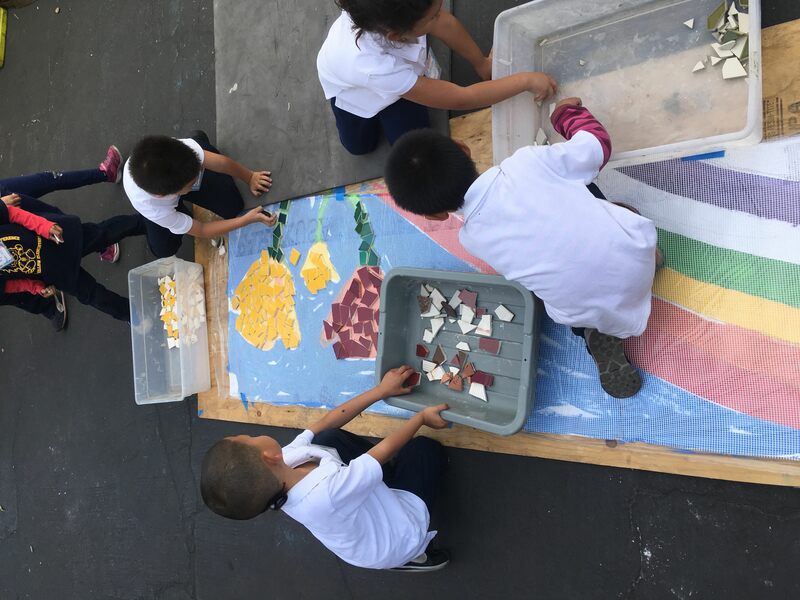 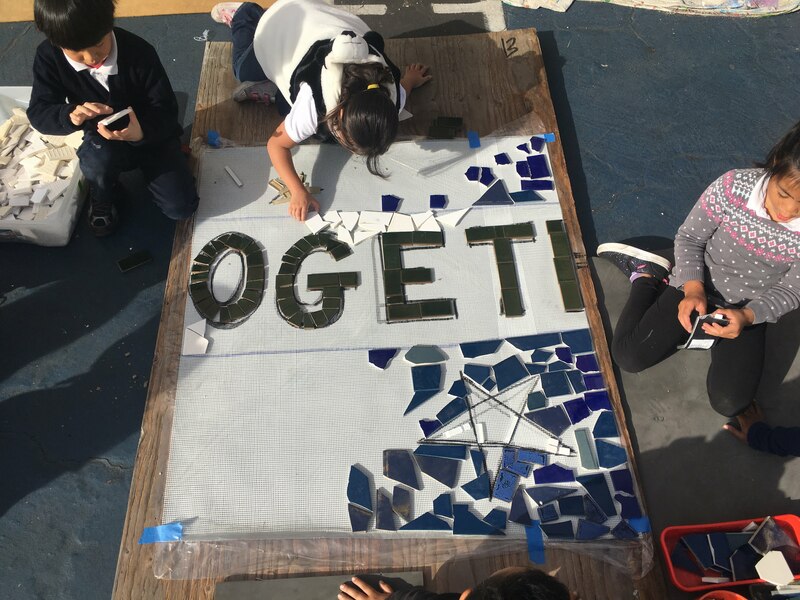 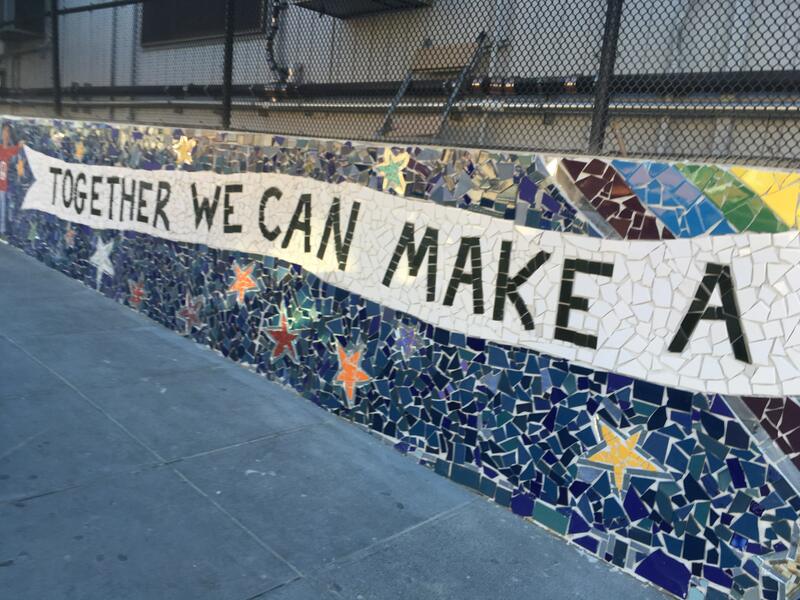 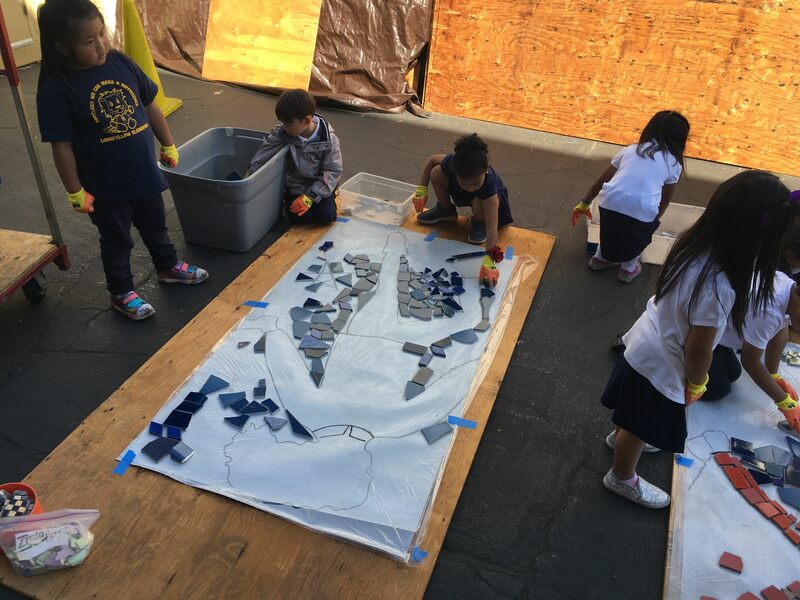 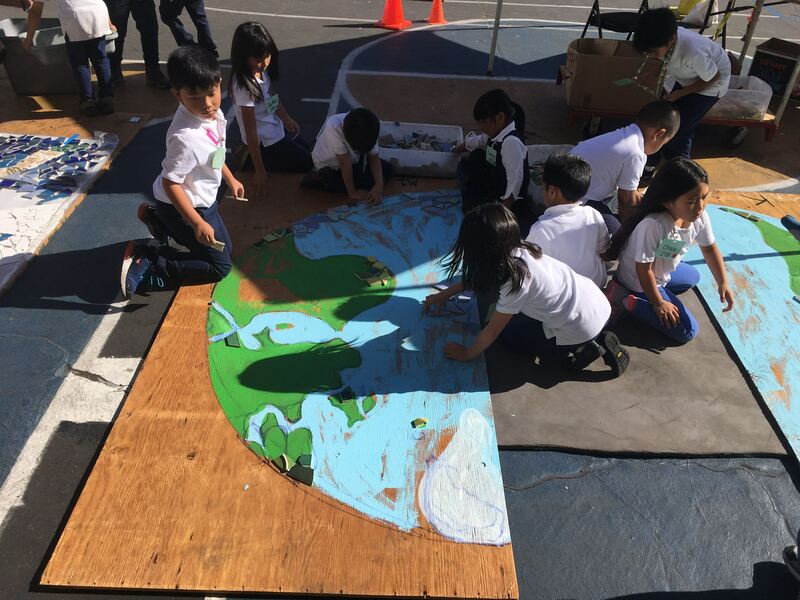 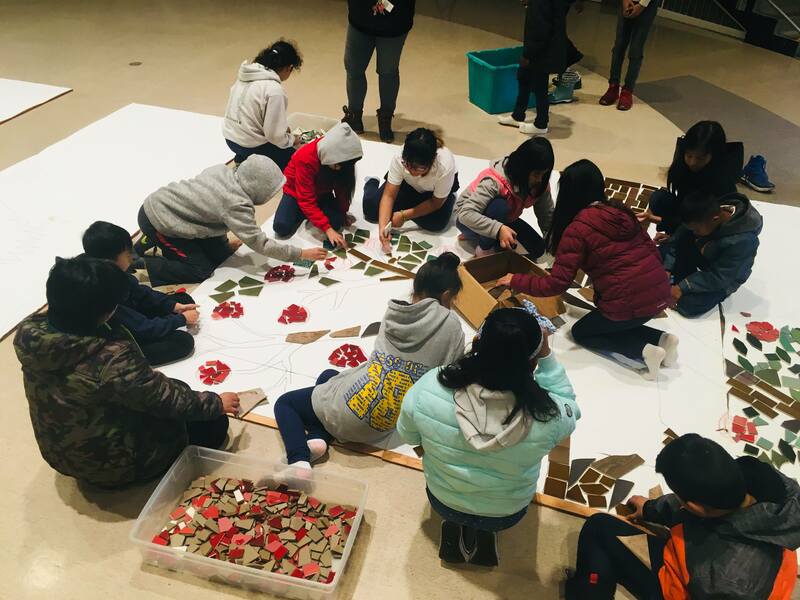 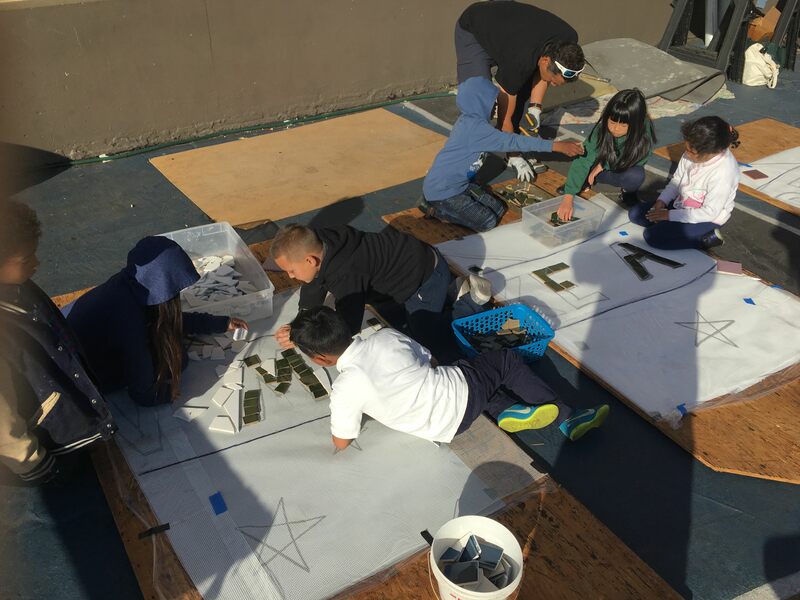 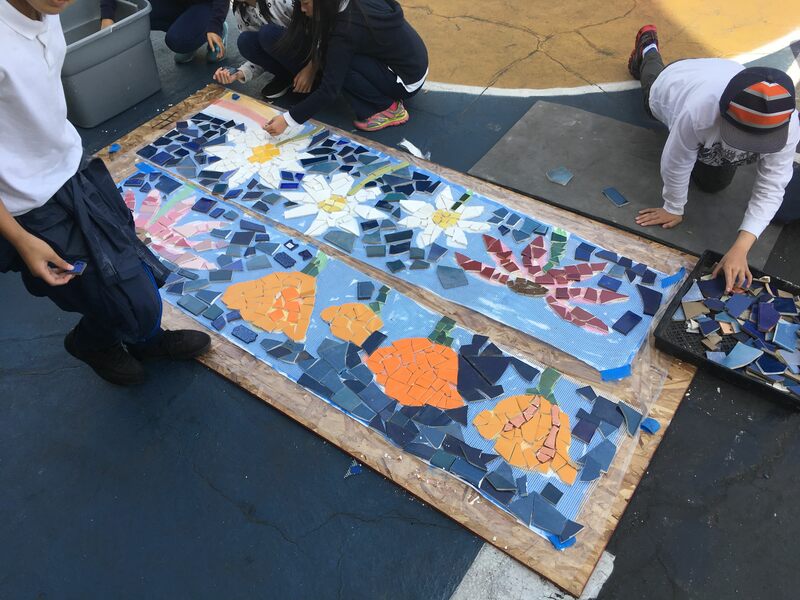 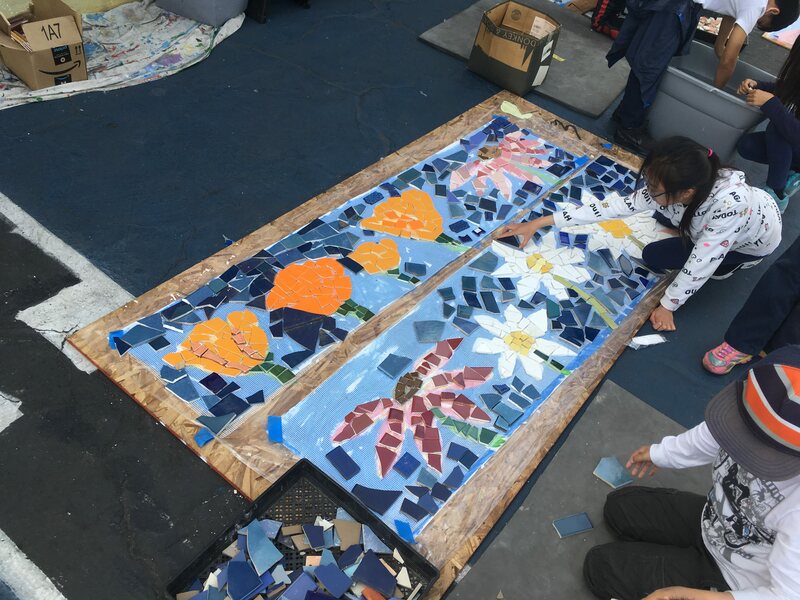 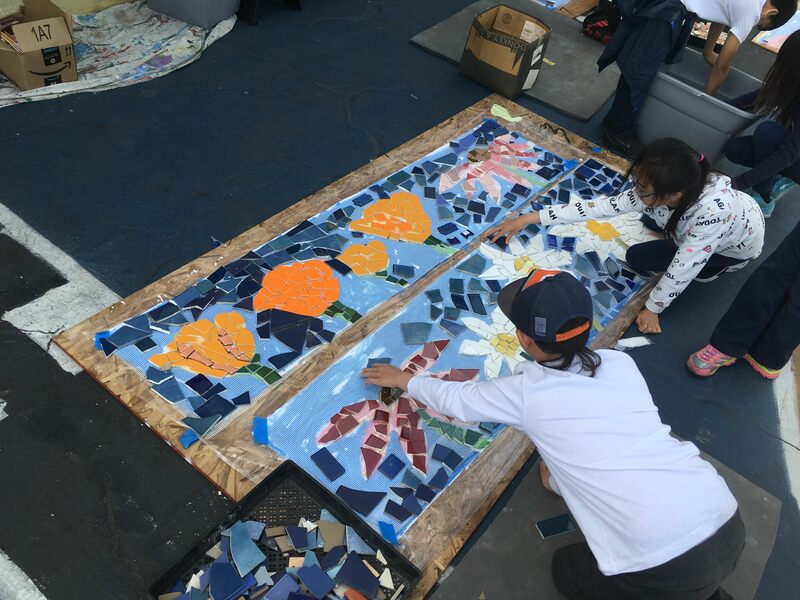 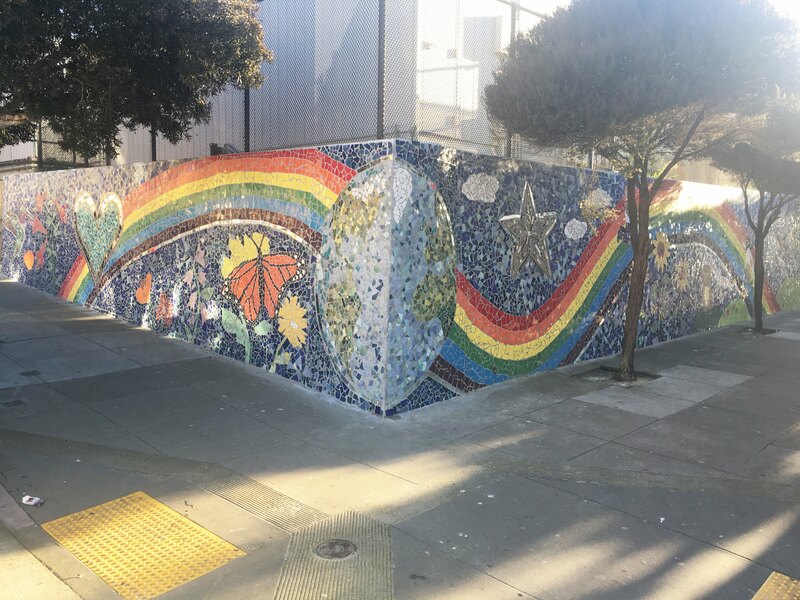 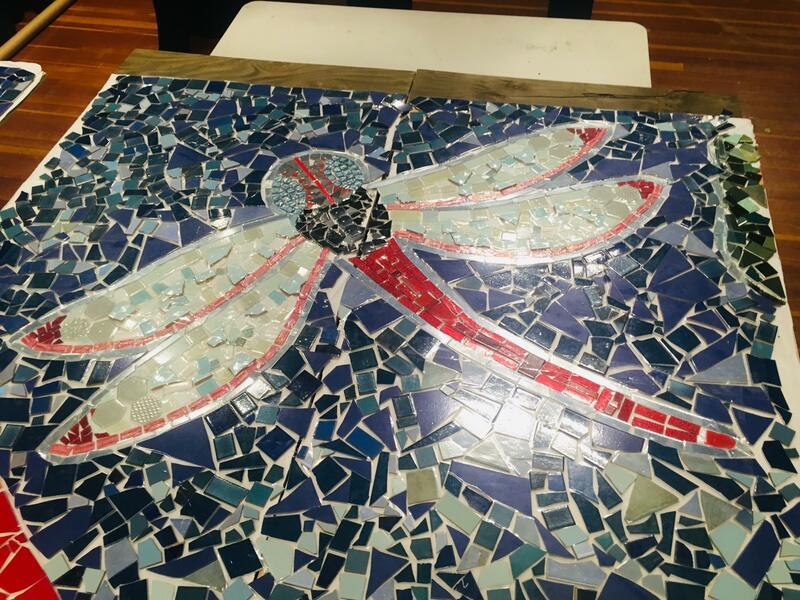 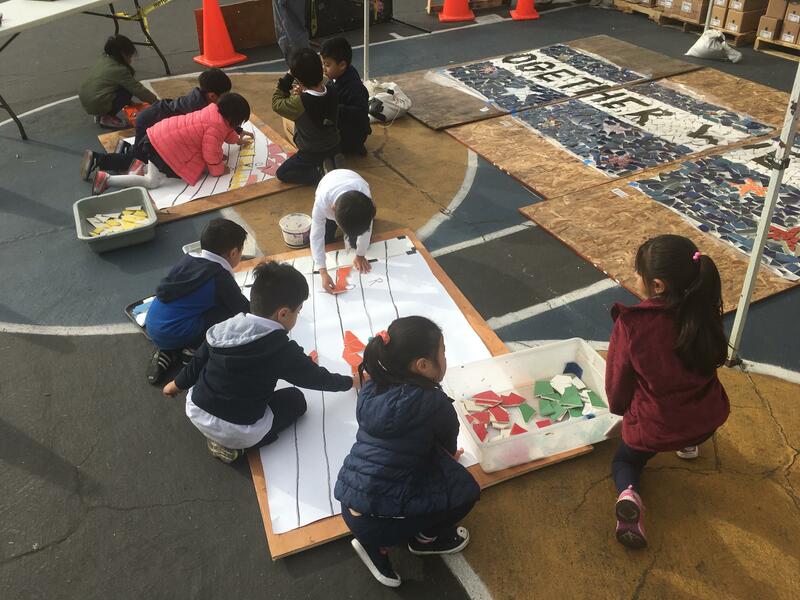 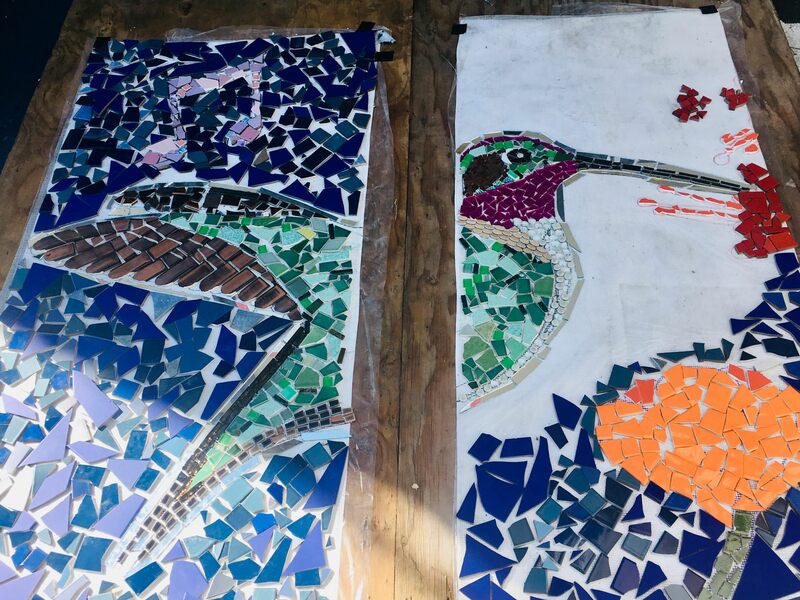 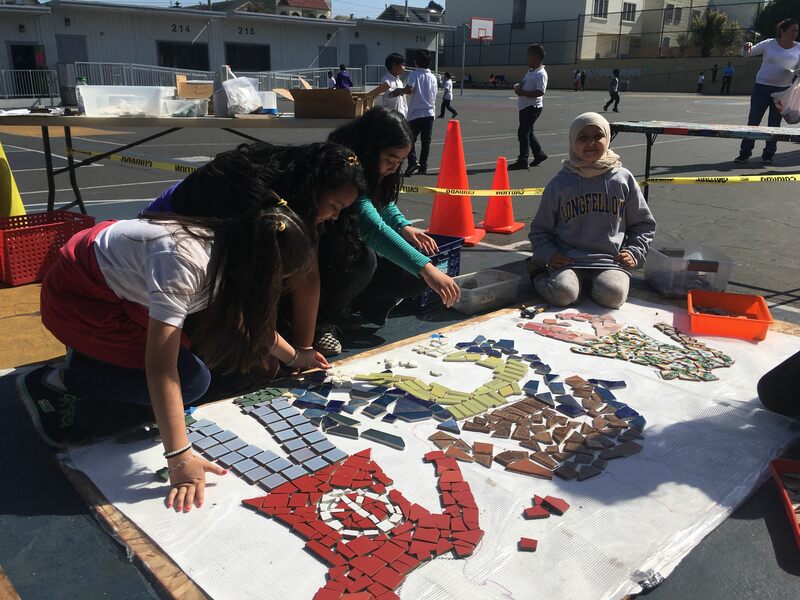 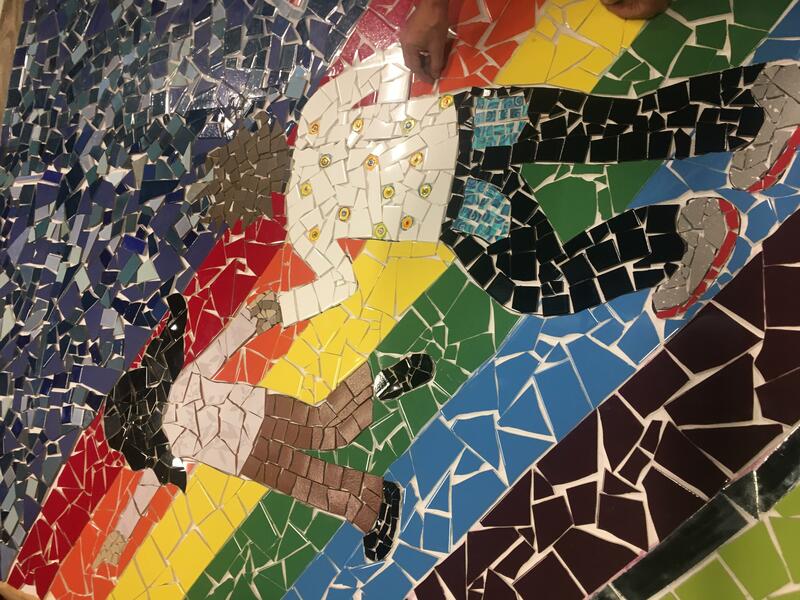 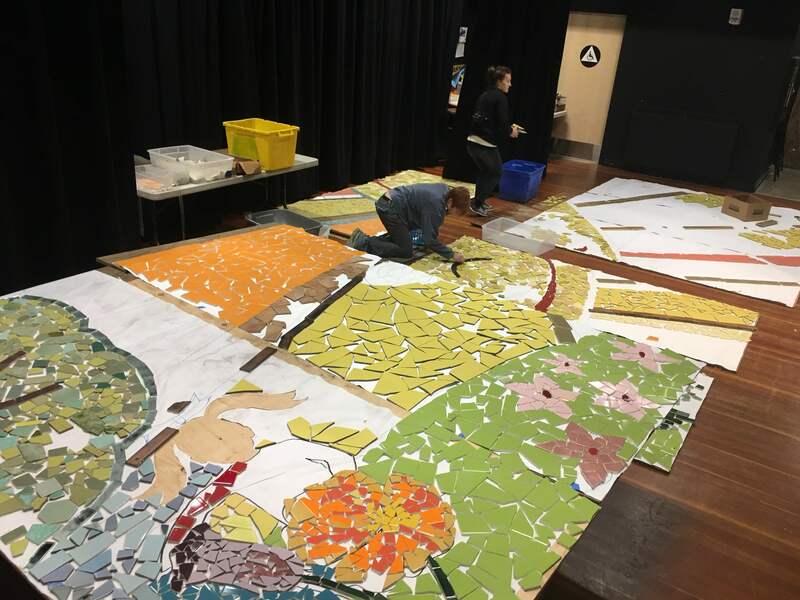 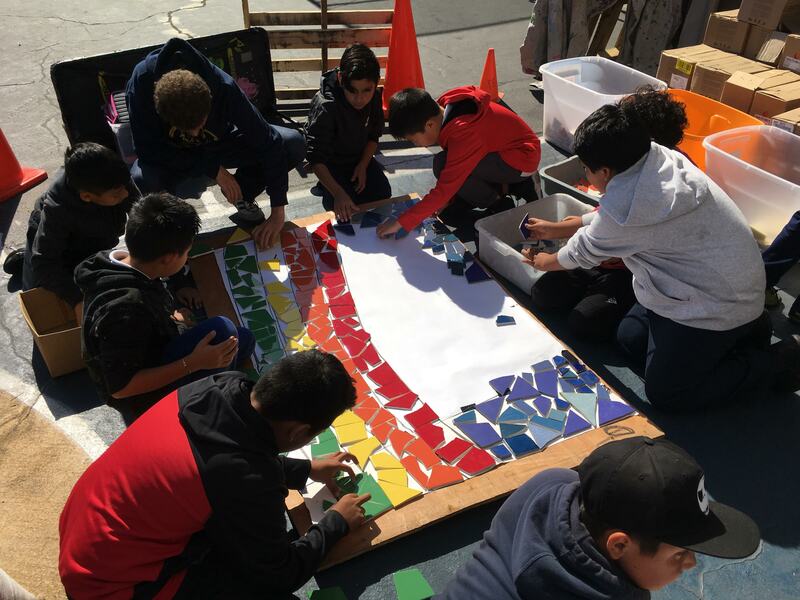 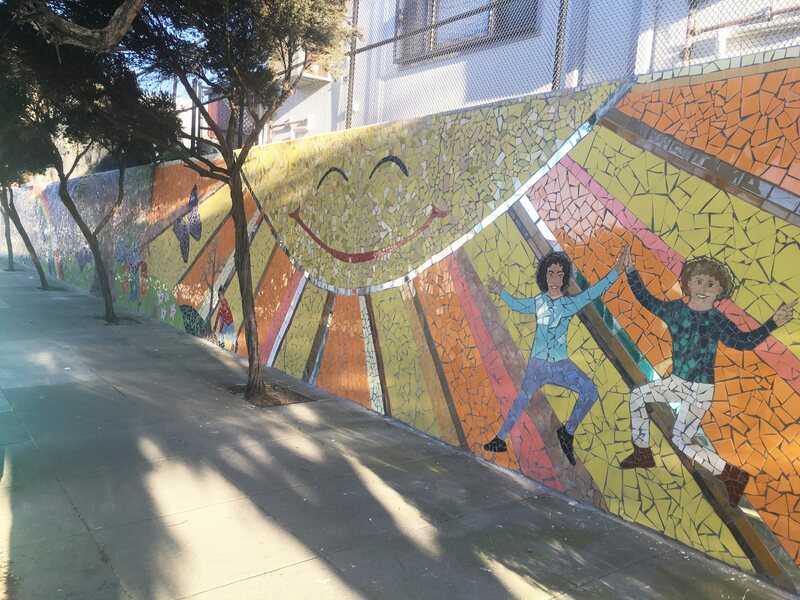 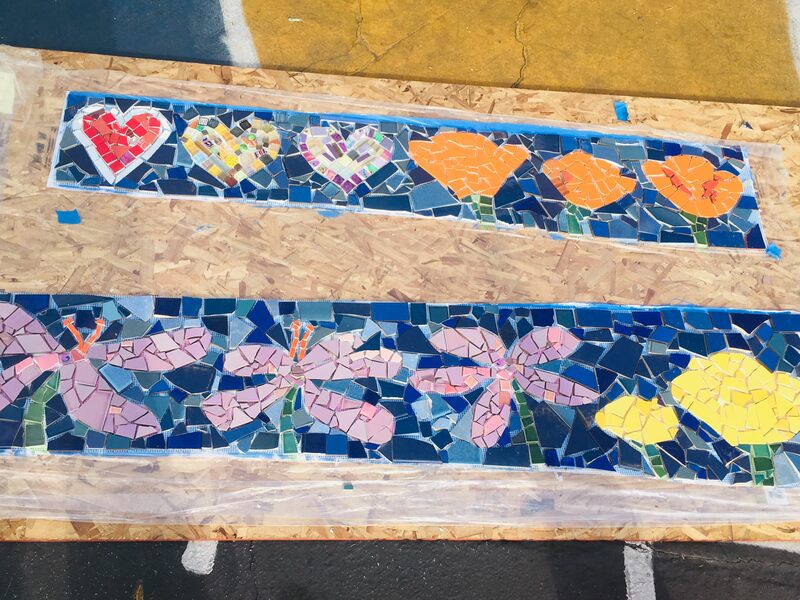 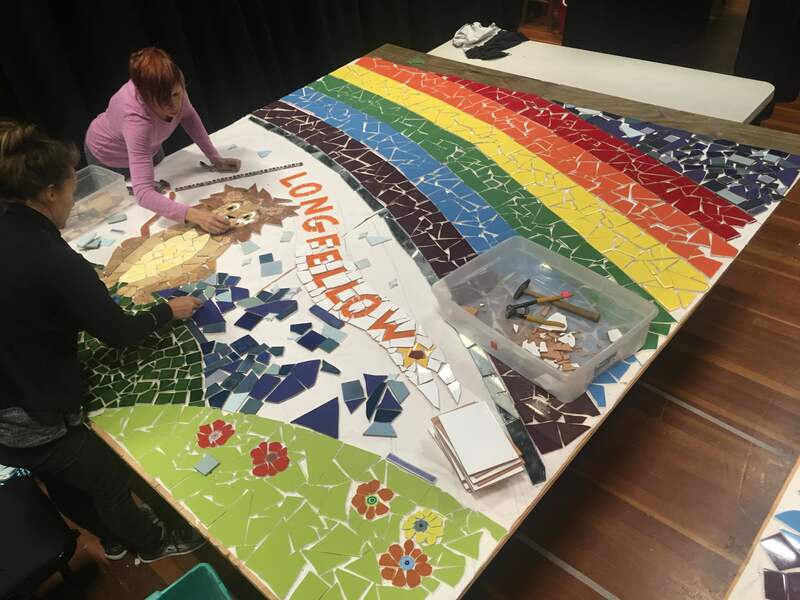 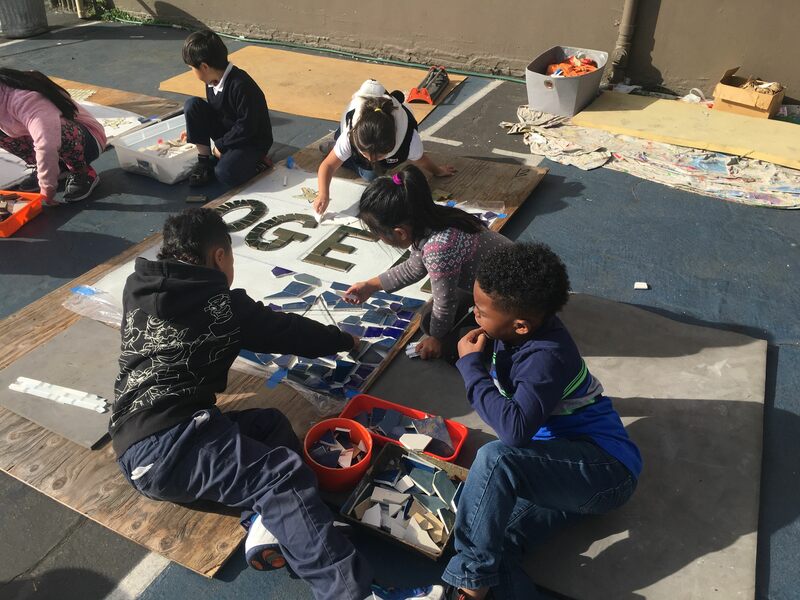 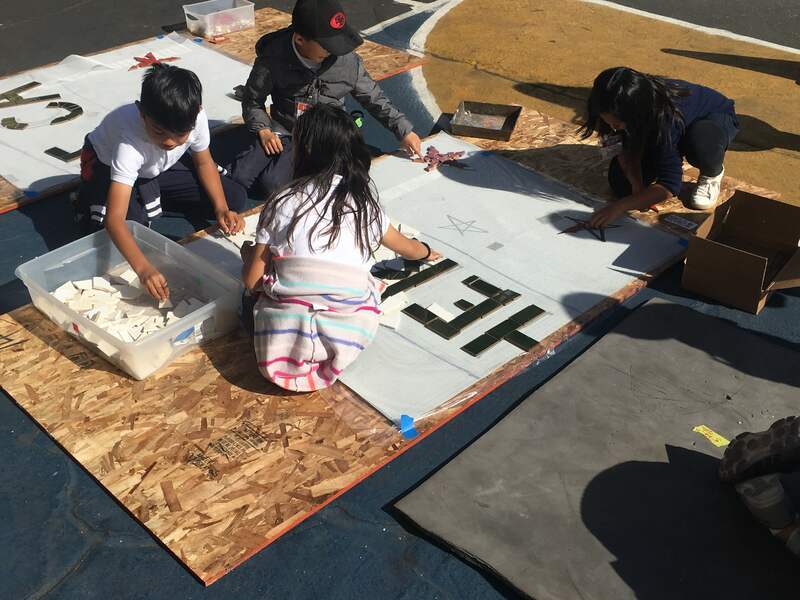 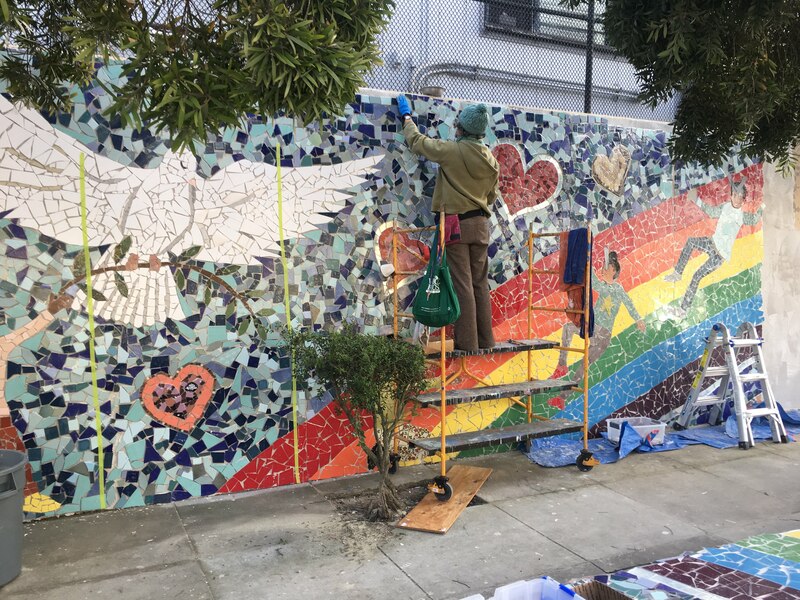 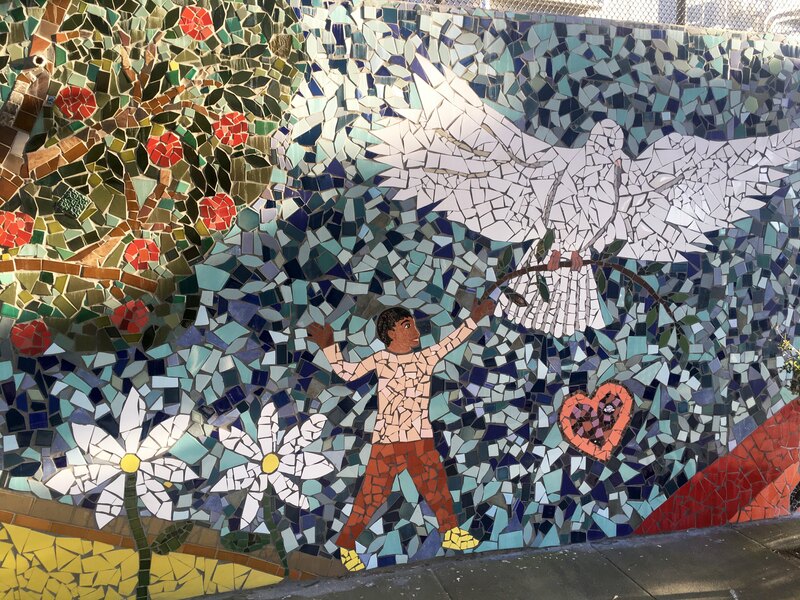 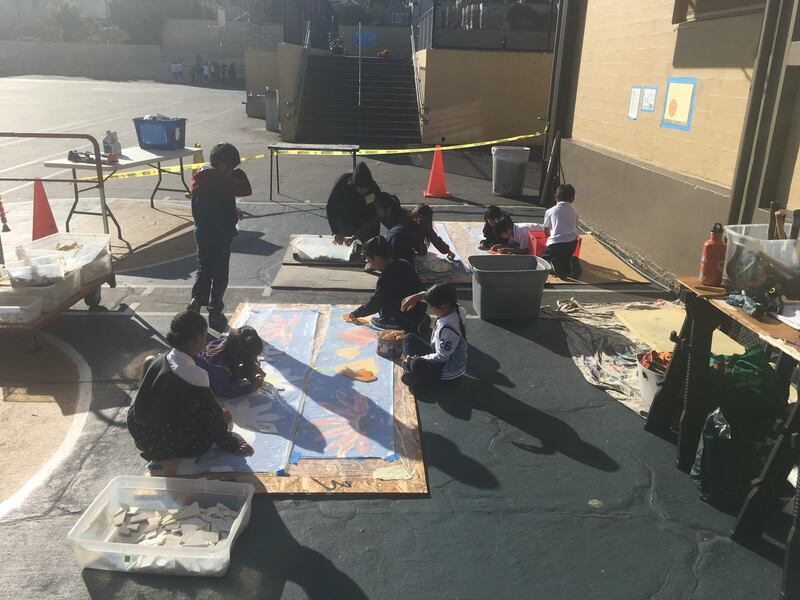 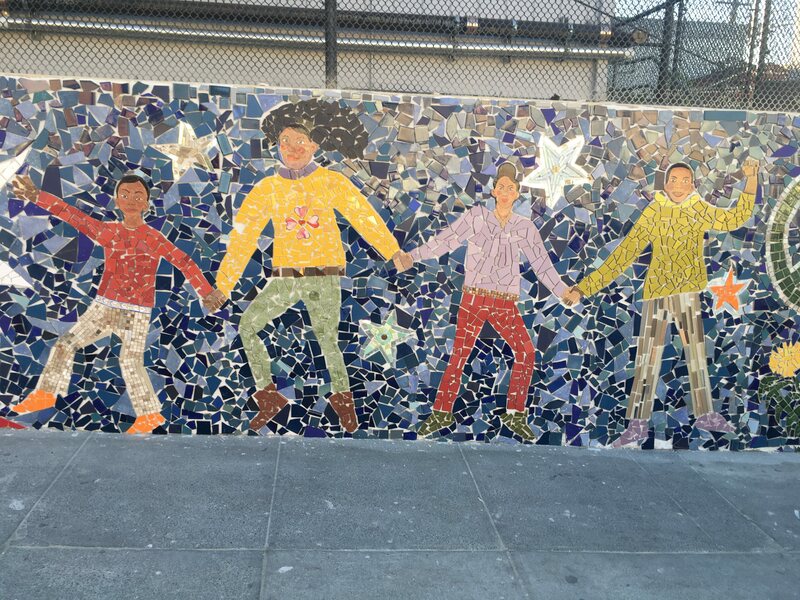 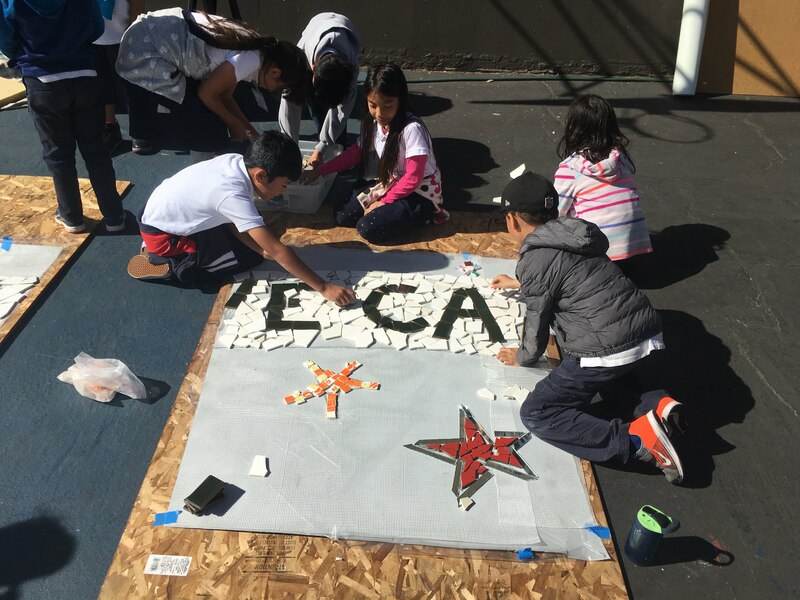 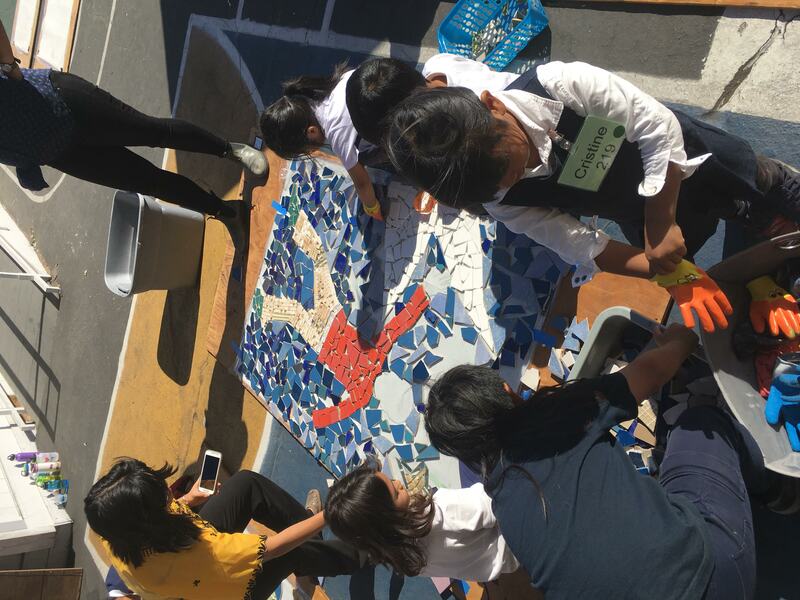 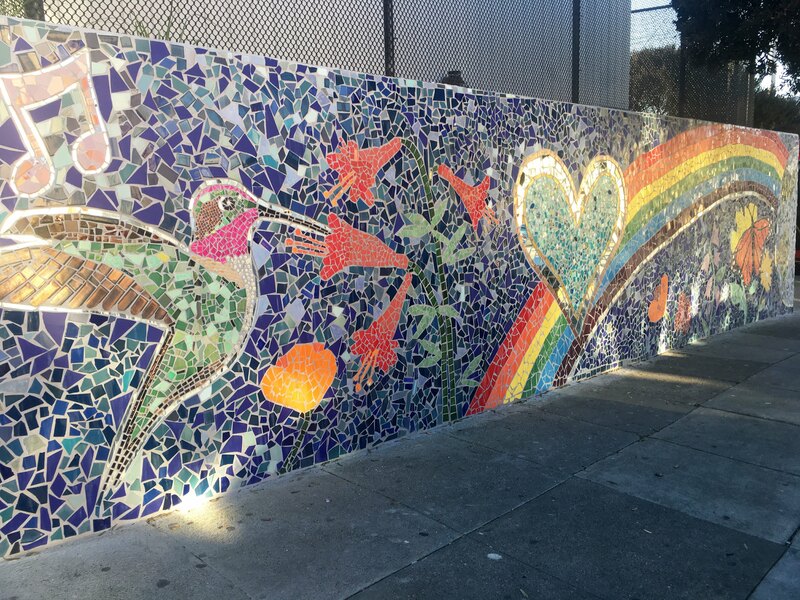 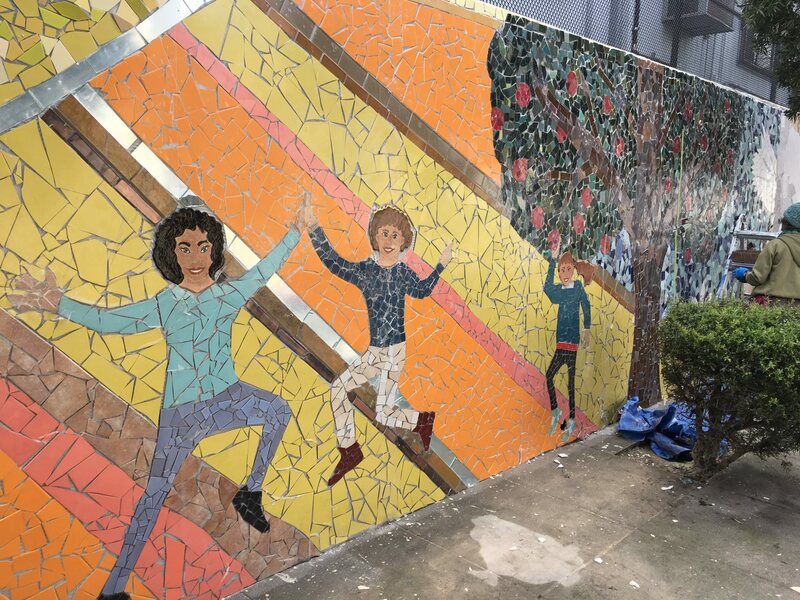 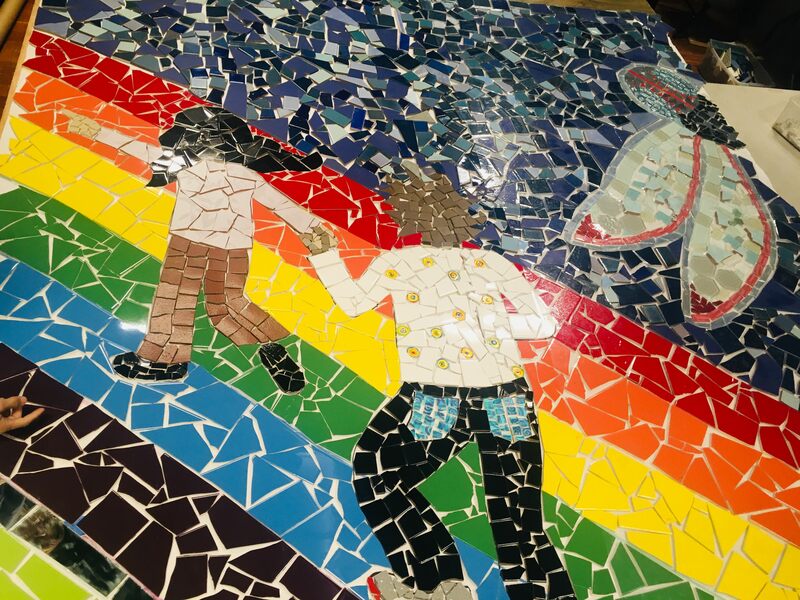 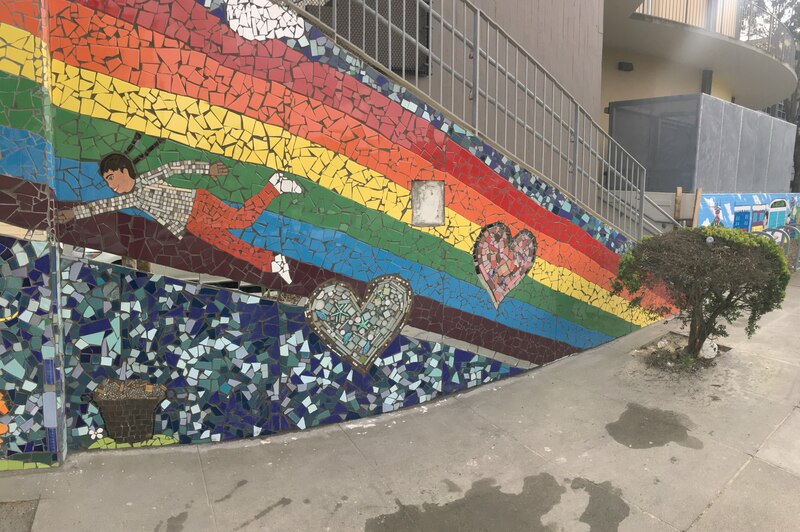 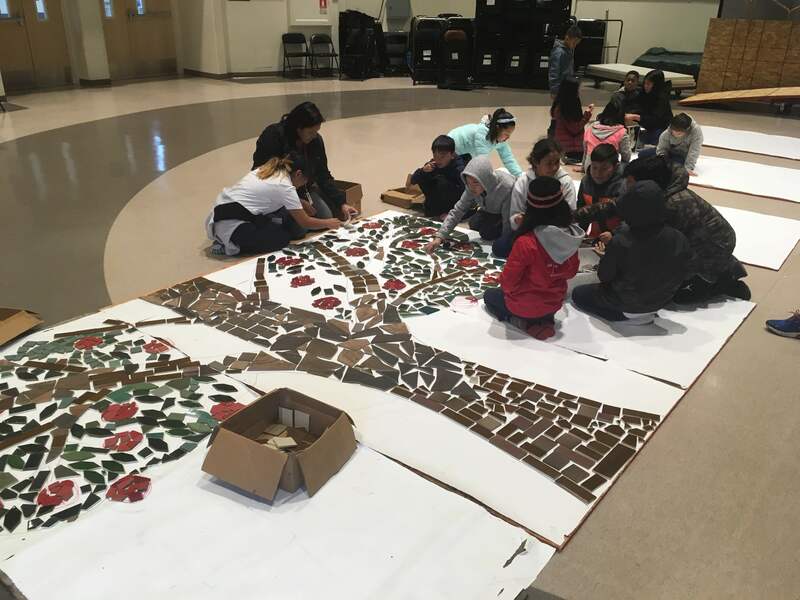 Longfellow Elementary School, a San Francisco Unified School District hired Create Peace Project to lead a massive 2,500 square foot mosaic mural. 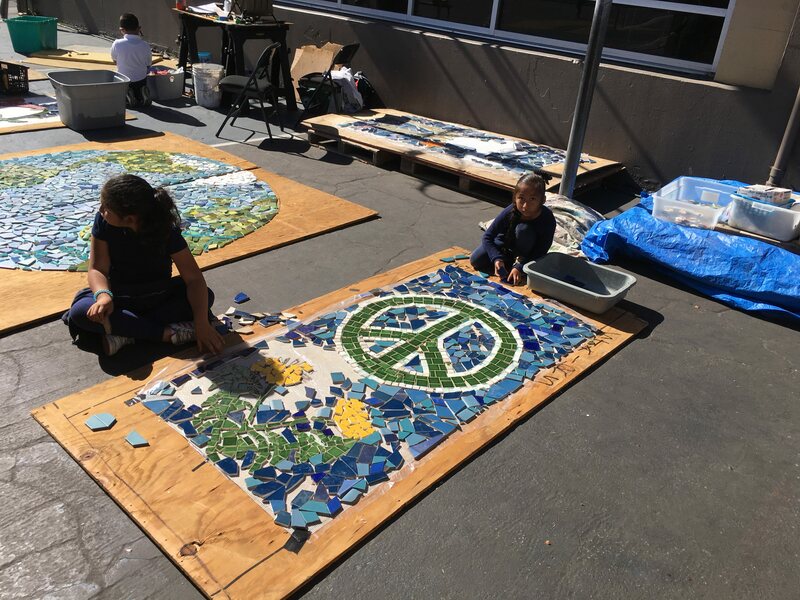 The first two weeks of “Our Pathway to Peace” involved visits from every classroom, and thus every student, at Longfellow. 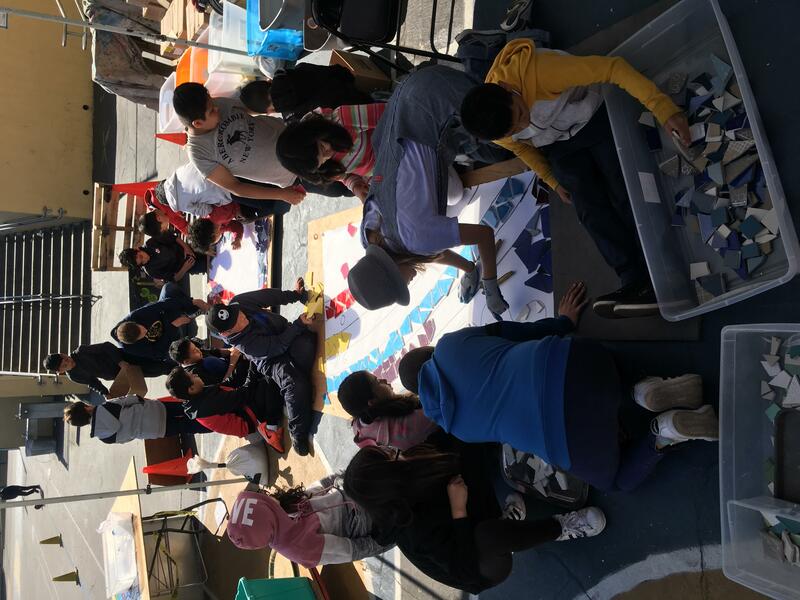 Beginning on the Lowell Street side, Create Peace Project’s team had previously transferred the mural design onto large-format paper, directly correlating the size and shape of the wall. 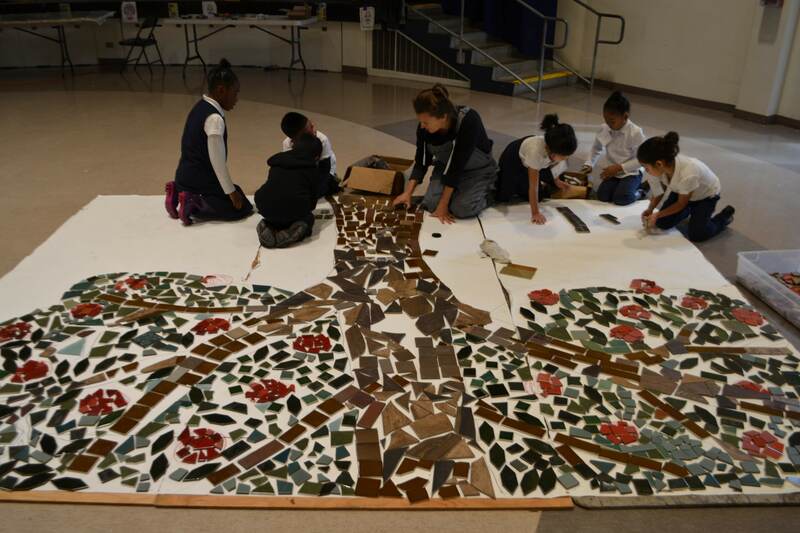 The design was then mounted on to plywood for student to create the mosaic on. 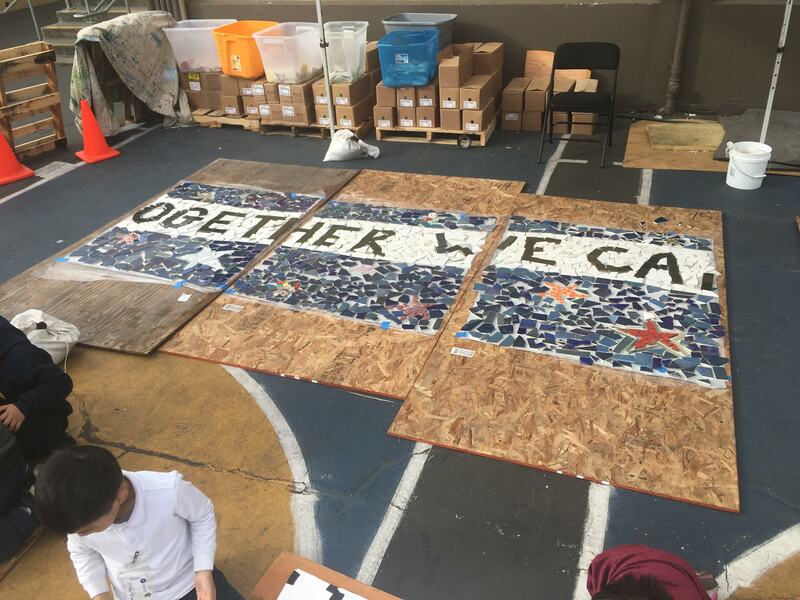 During these first two weeks of October, students were given the opportunity to select the section of the mural they wanted to create (based on what we were working on that day), choose their tile, and use the broken tile pieces to create the picture on the board before them. 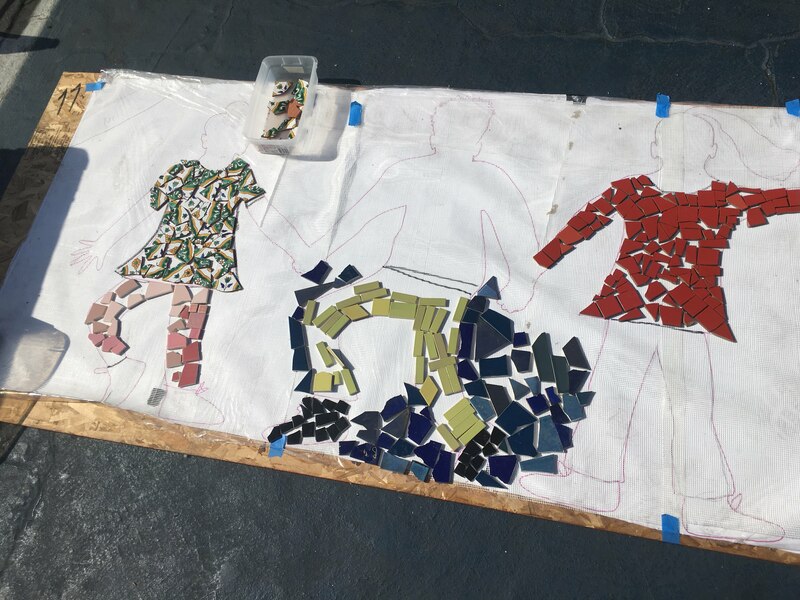 During this phase, we were creating the mosaic atop fiberglass mesh, a tool we used for the Lowell Street side to allow students to experience one technique for professional mosaic making. 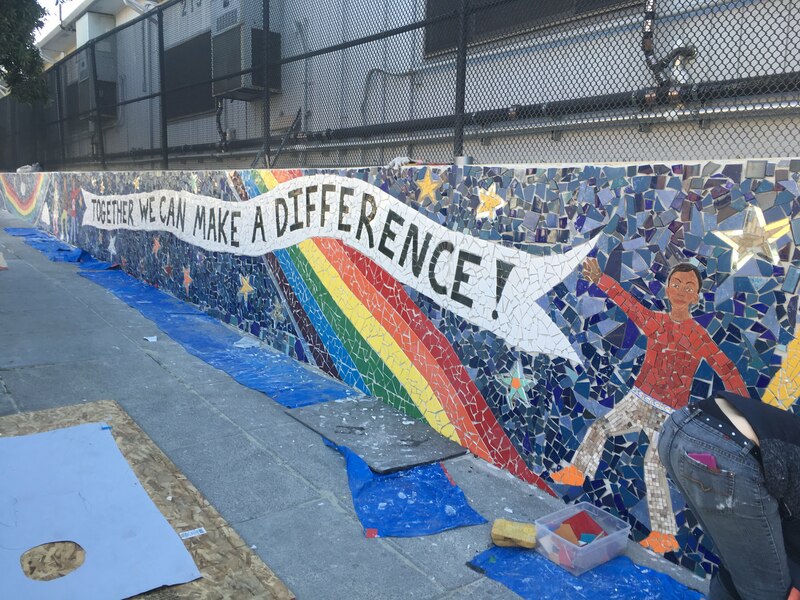 We were able to complete nearly all of the 800 sqft of the Lowell Street side during these two weeks. 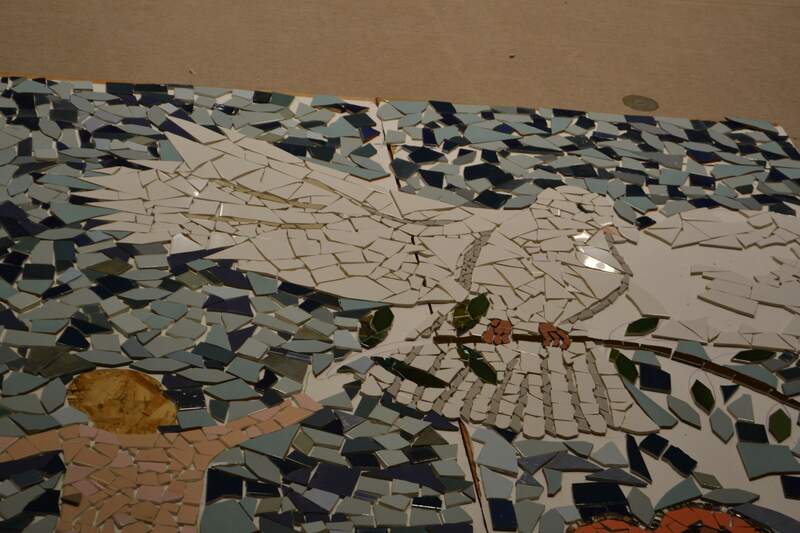 The second two weeks of October were spent gluing the tile onto the fiberglass mesh. 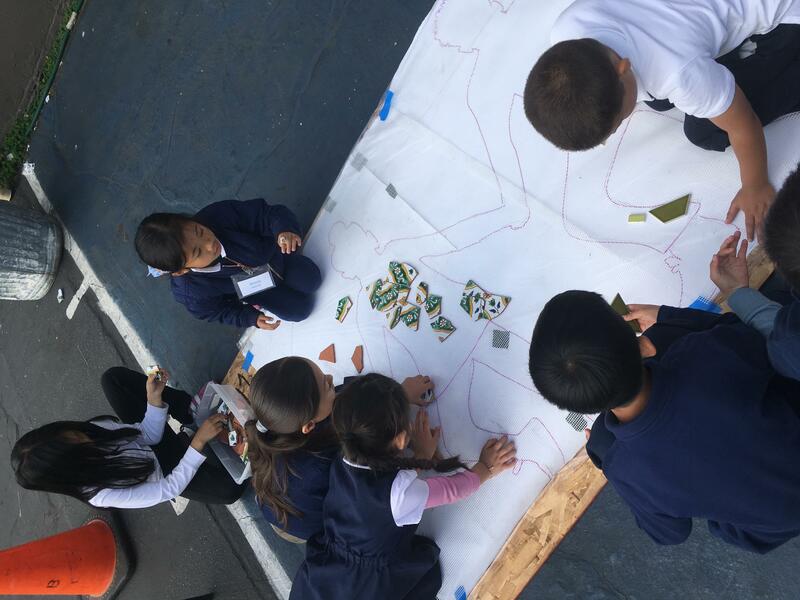 Following the same schedule, working with five classrooms a day for approximately 50 minutes, a half-classrooms at a time, we engaged the entire student body (aside from about 50 students) for a second time. 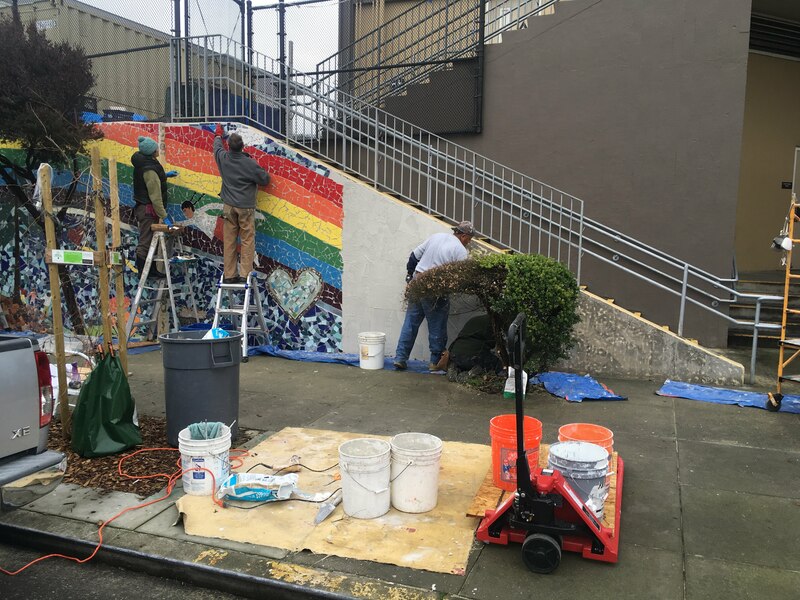 During those two weeks, the students along with the Create Peace Project team glued in place that first section of our mural. 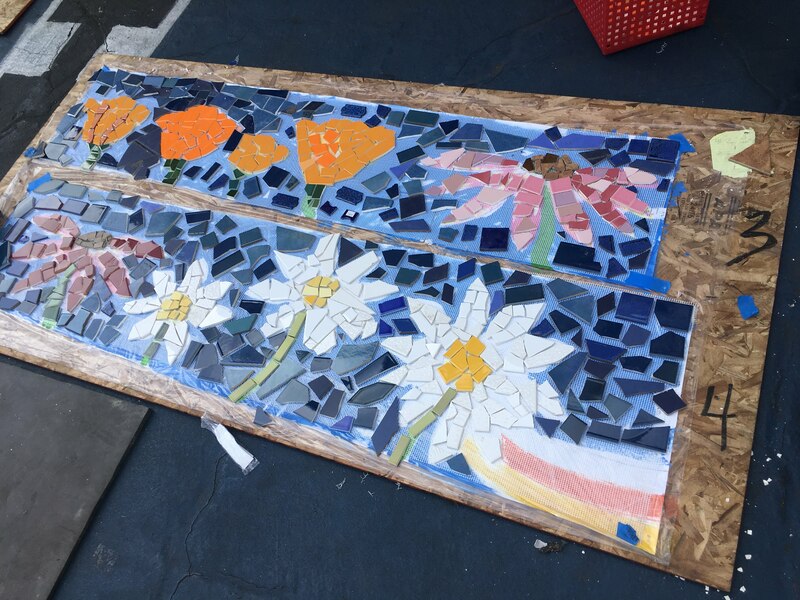 Pick each piece up, put a dab of glue on the back and return it to its place. 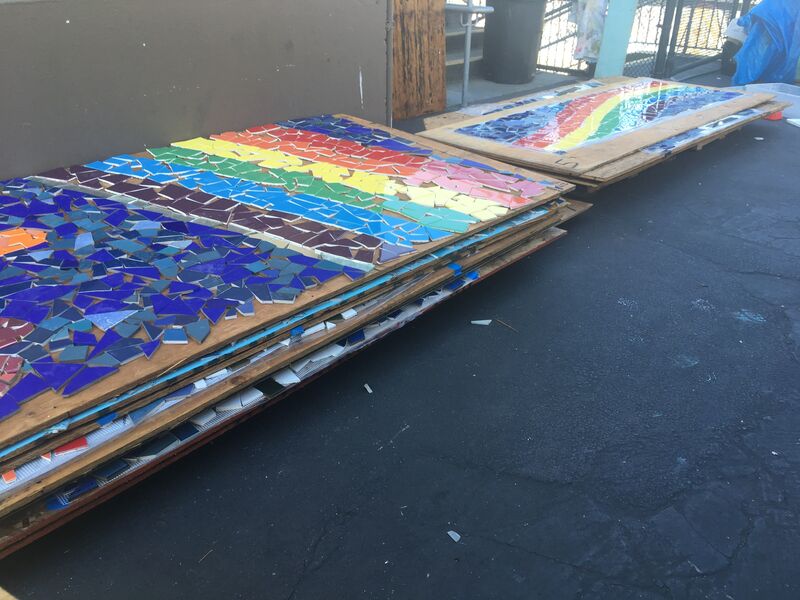 Completed boards were stacked and stored upon completion. 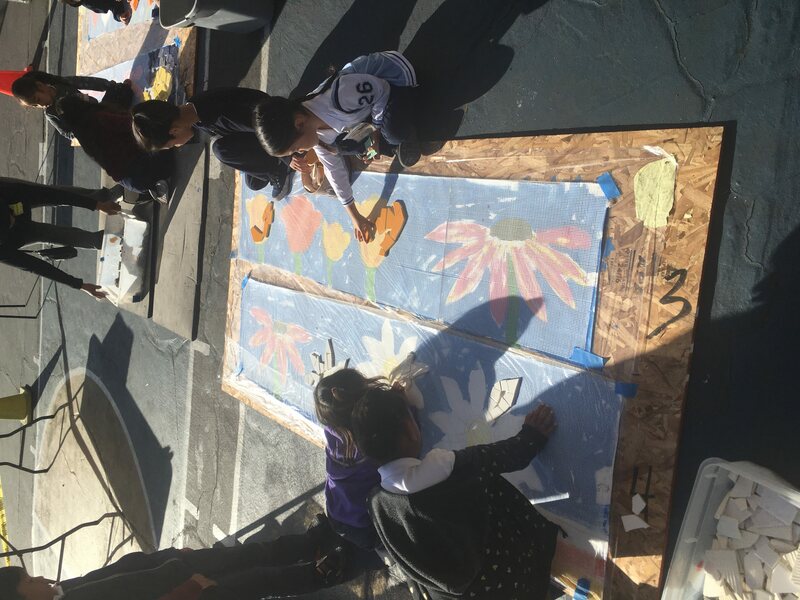 November: Prior to our fifth week of the project we hosted our first community day on November 3rd. 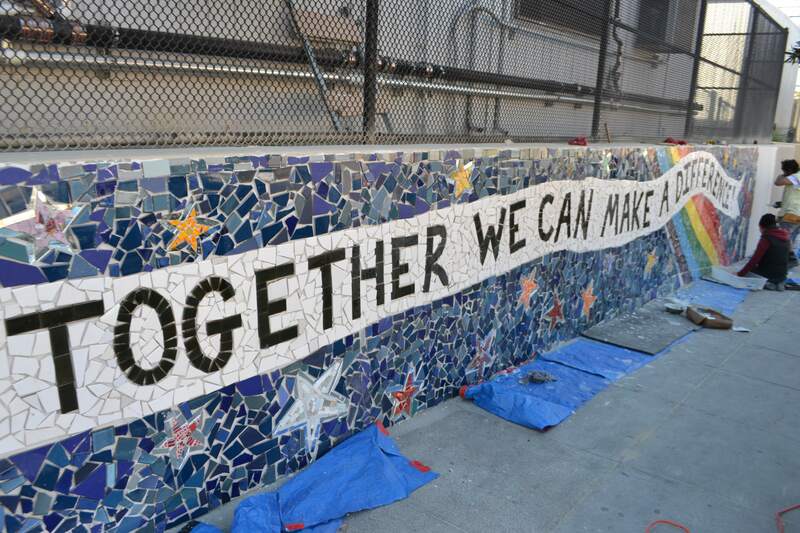 In anticipation of a big day, Create Peace Project prepared the first 60ft of the Morse Street wall. 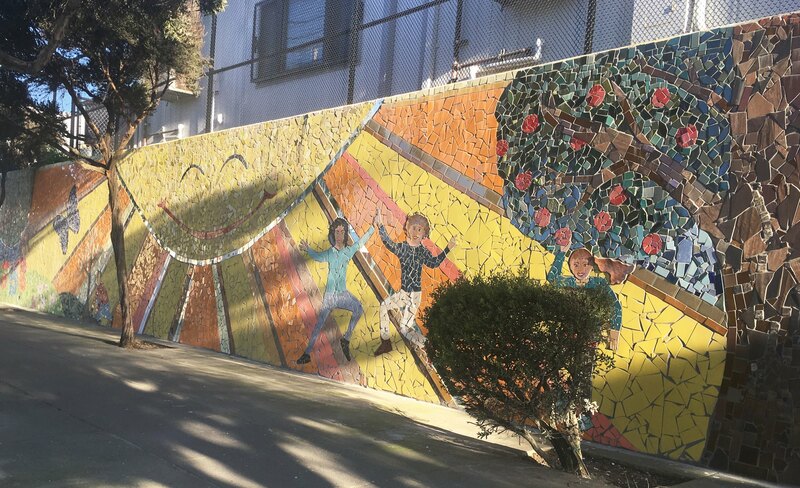 We mounted the next stretch of our mural design onto 15 pieces of plywood (4 x 8ft). 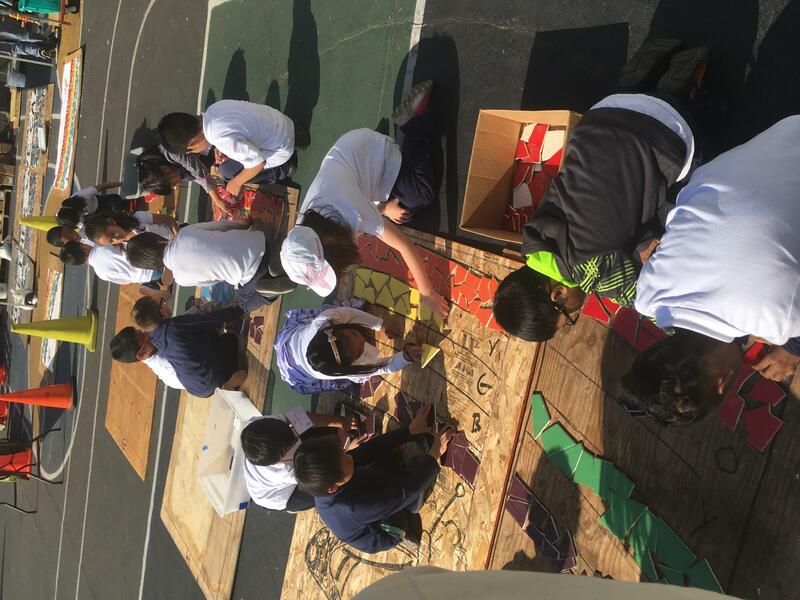 Plywood design boards were laid out on tables for the community to create upon. 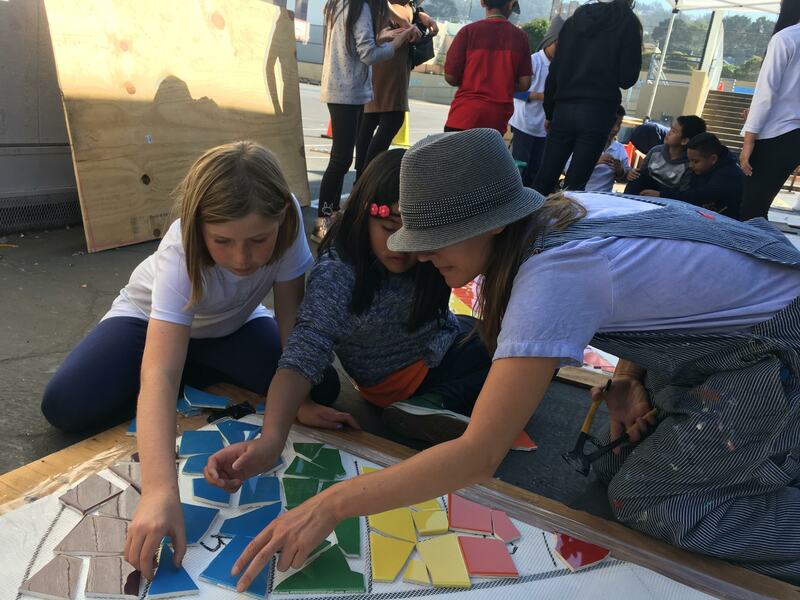 We had more than 60 families and community members join us for the day. 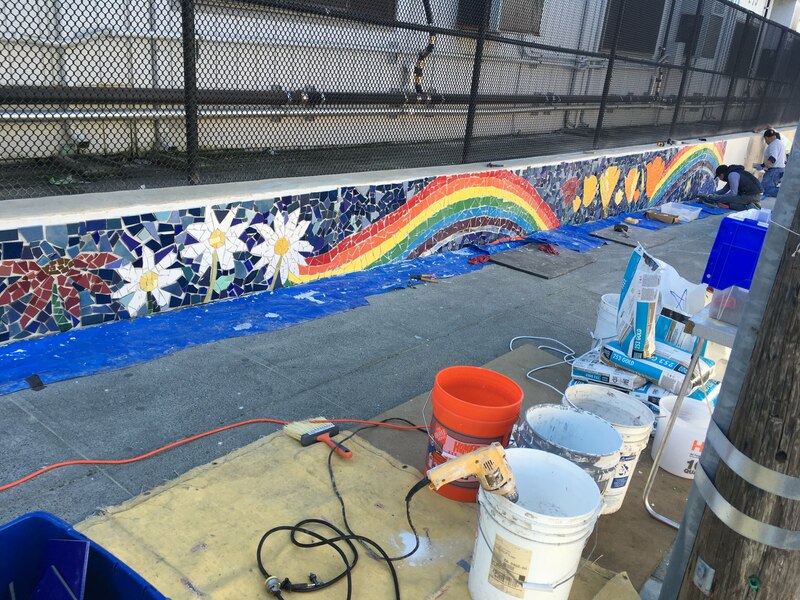 In one day, we roughly completed nearly all of that 60ft. 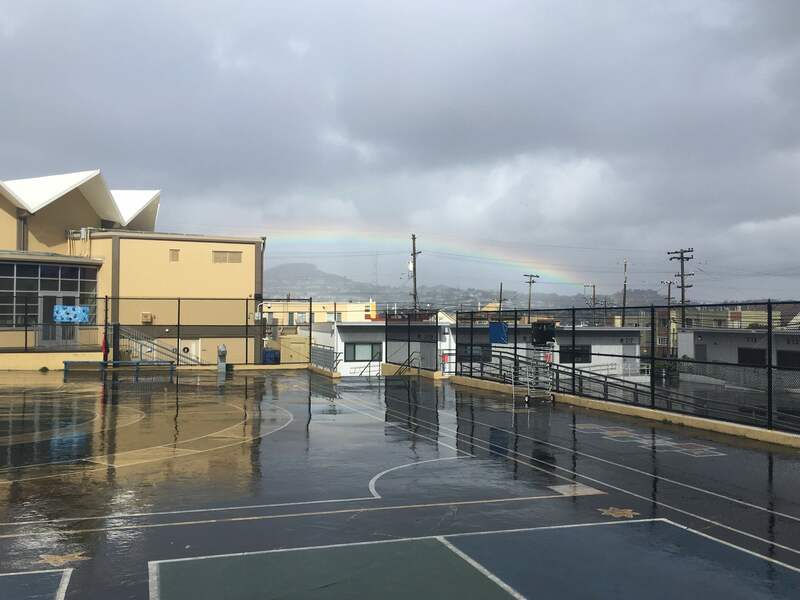 Week 5 was spent without students. 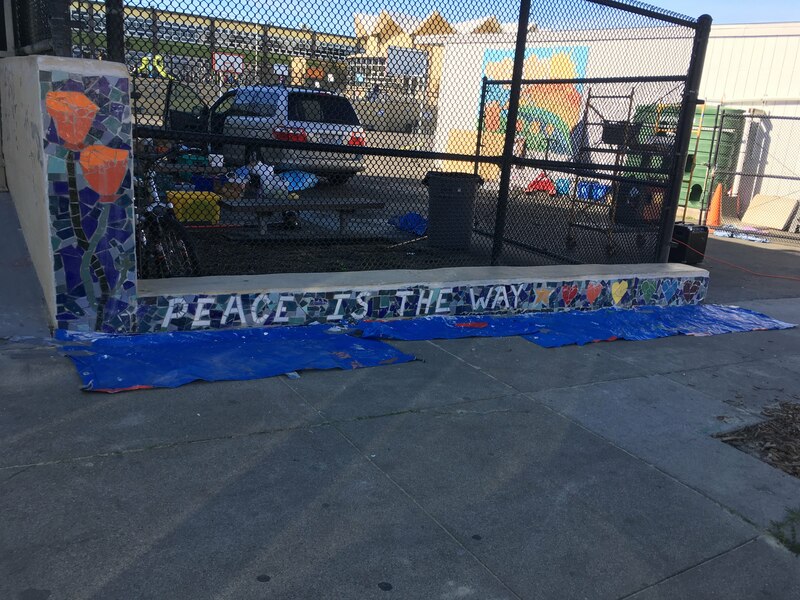 During this week, the Create Peace Project team detailed and completed those 15 boards, and prepared the next 100ft of the mural on new plywood in anticipation of the eager students return. 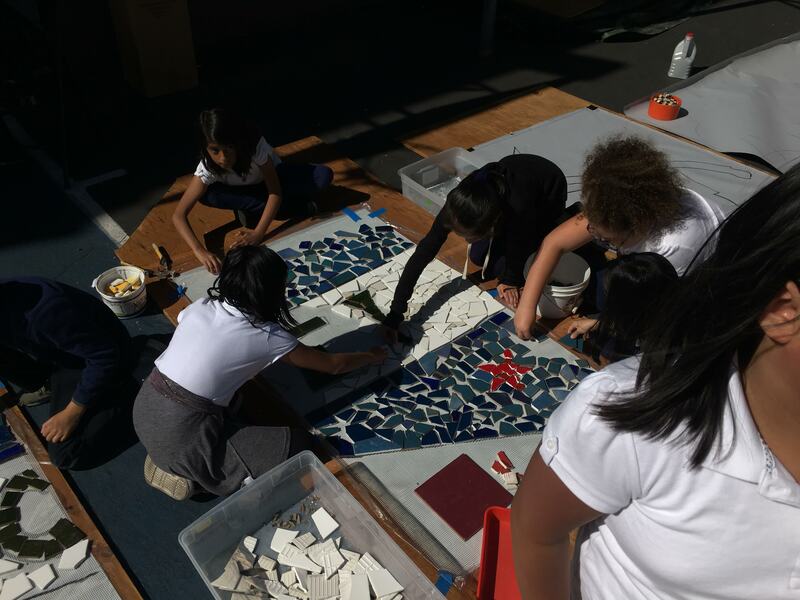 For this phase, we switched tools and began using tile-tape, a heavy-duty roll of tape designed for mosaic making. 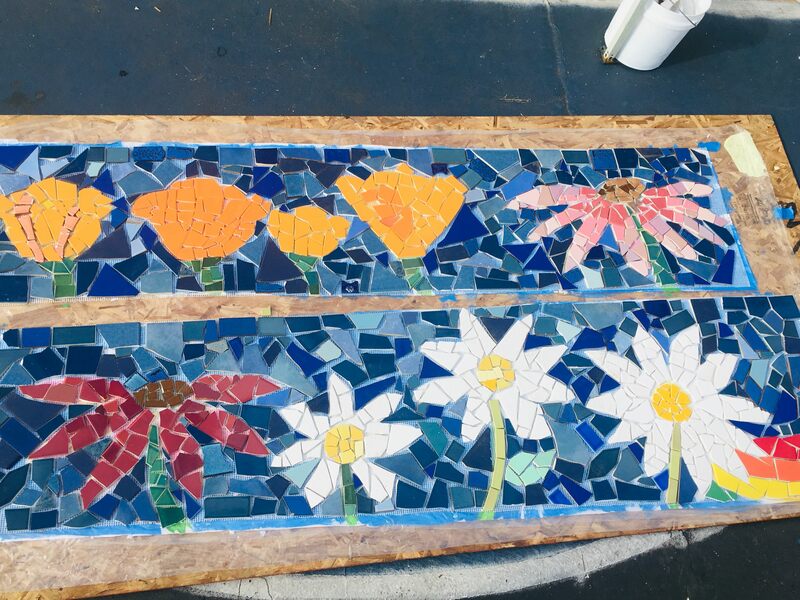 We use a 4ft roll and stick it atop the completed laid out mosaic, tape will then be cut into manageable sections to mount onto the wall. 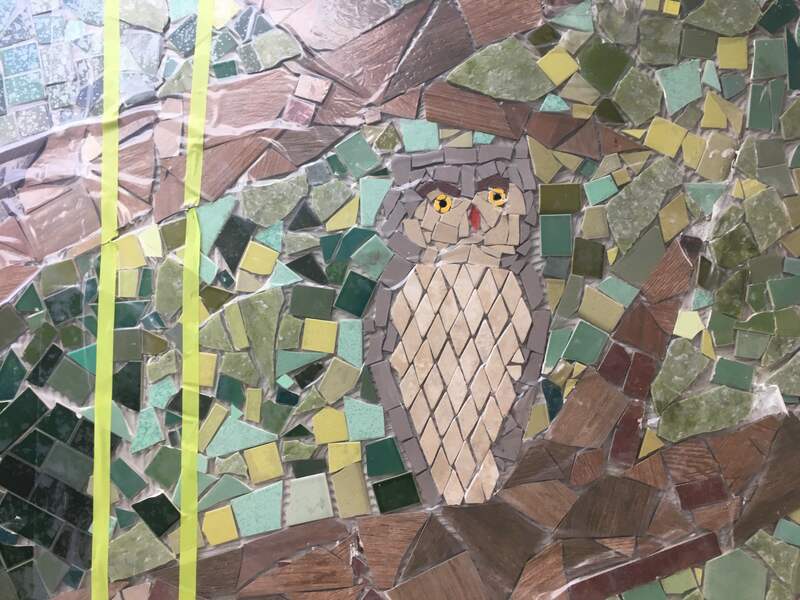 Once the mortar is dry, the tape will peal nicely off the front. 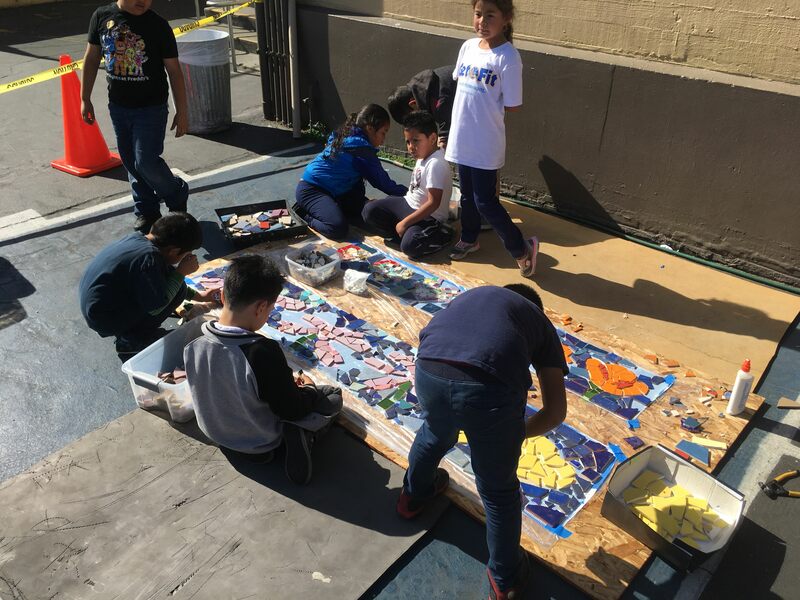 We continued with our schedule and over three weeks of November, we fulfilled the cycle of classroom visits, giving every student a third opportunity to participate in this mural project. 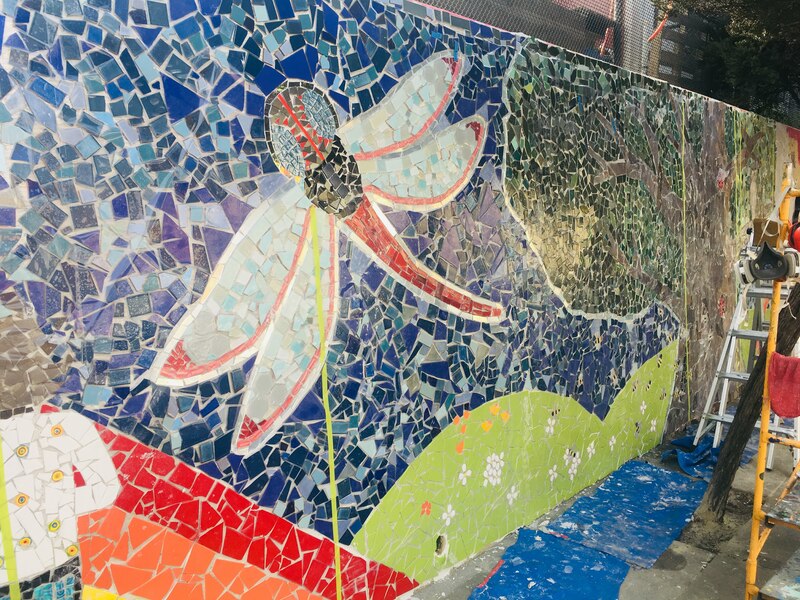 The days were spent creating huge sections of the mural, and during this time we were able to complete approx. 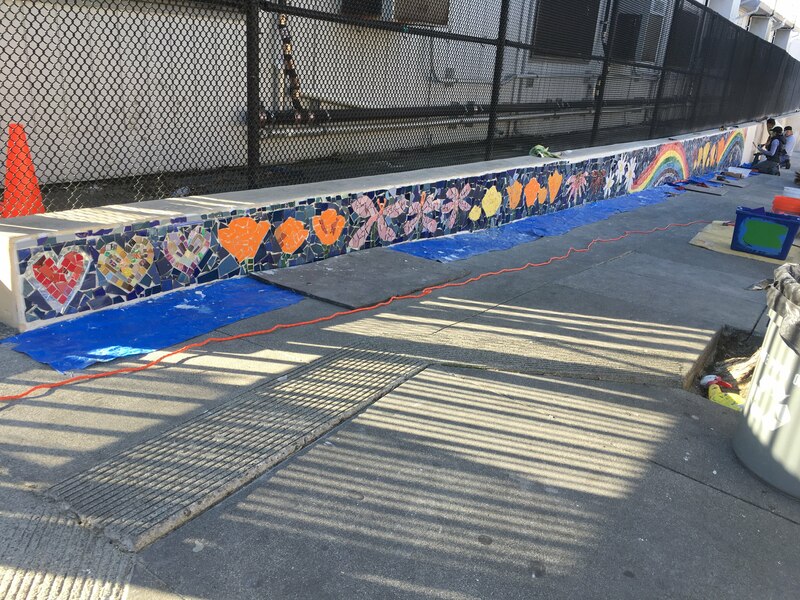 1000, or the remaining 1500 sqft of the mural. 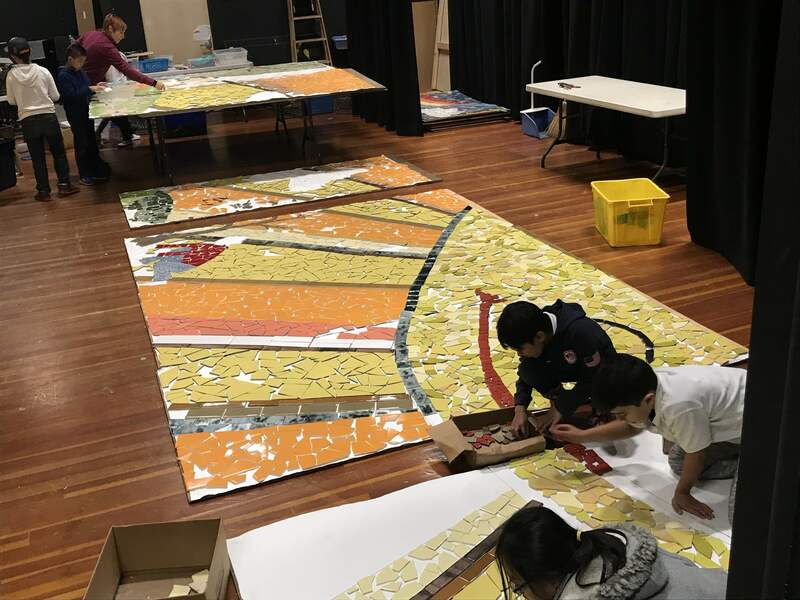 December: The first week of December was spent completing the numerous boards that were created over the previous weeks, and laying tile tape to secure the completed work in place. 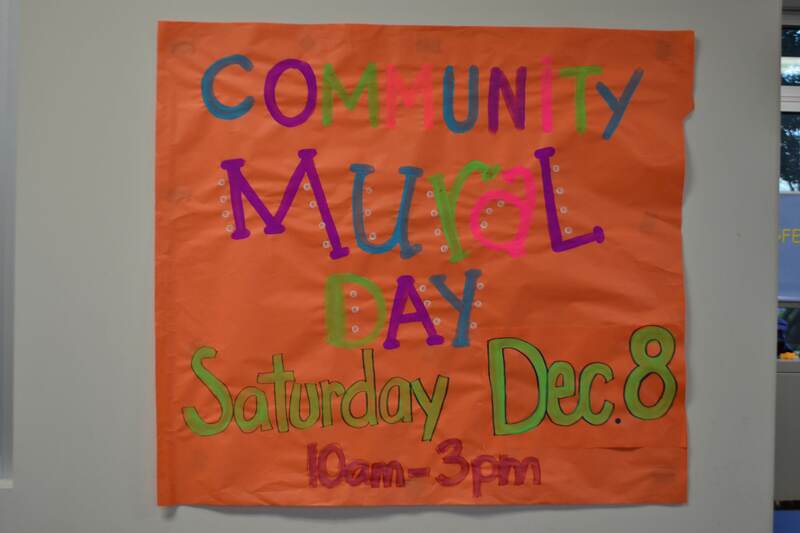 We also spent time preparing the final 500 sqft for our 2nd community day on December 8th. 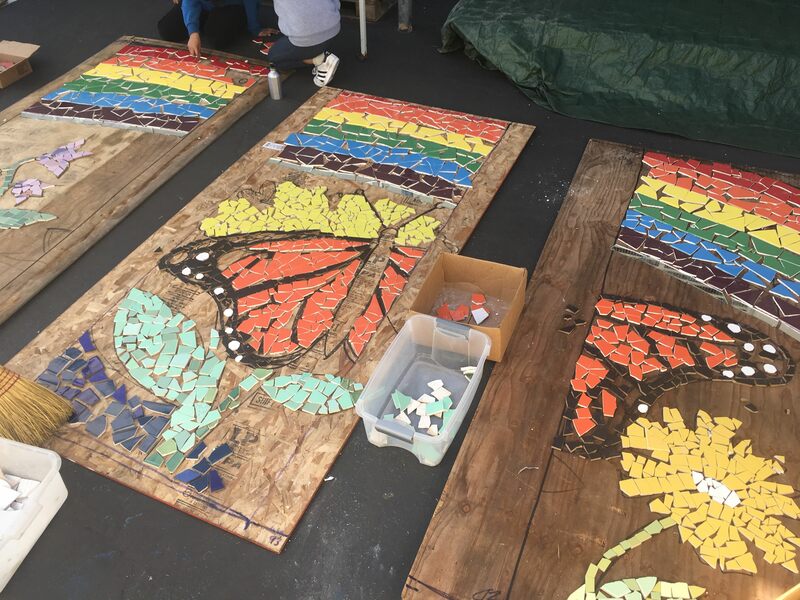 On the 8th, another sweet turn-out of families, staff, and neighbors worked diligently to complete the remaining 10 boards, organizing broken tile piece in an artistic way to match the design on the boards in front of them.